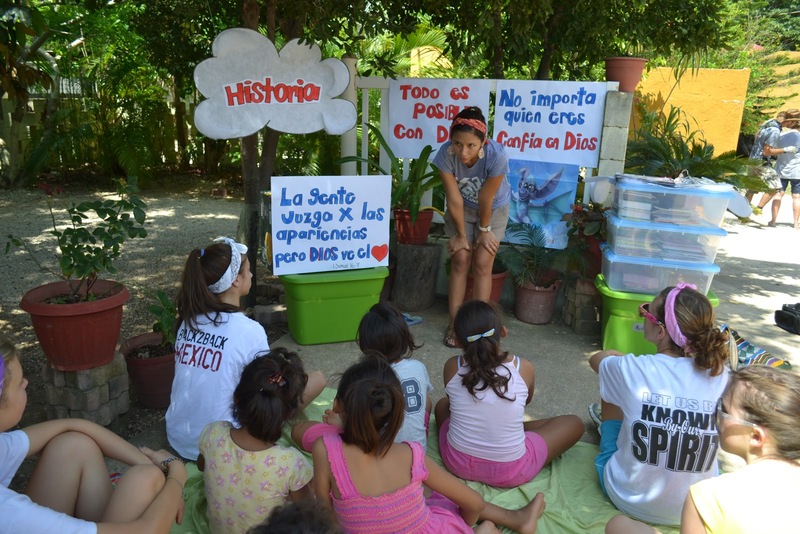 This week, we presented our new VBS called “Sky,” to three families, at Casa Hogar San Jose and at the CAT. 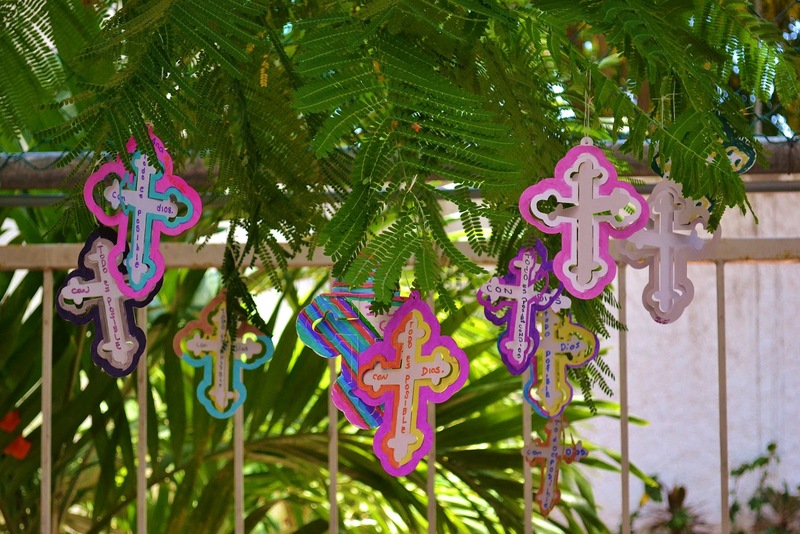 The theme for the Vacation Bible School is based on Mark 10:27: Todo es posible con Dios — Everything is possible with God. For many of these kids, this is perhaps a new truth and a very important message. We continue to build bridges with the kids and the staff at the CAT (government shelter for abused and neglected children), as God continues to show favor on this relationship. We will be doing VBS all summer with the teams that come to serve for our ministry partners. It was a great week in which we built relationships with kids, ministry partners, staff and one another. As our Back2Back staff reflected this morning on the week past and the week ahead, we were amazed at God’s blessings and favor on the work Back2Back is doing. Two years ago, when Back2Back Cancun started, Matt and Julie Cooper (B2B Cancun directors) were looking for someone to help clean the group house. The security guard recommended his cousin, Dalila. Since then Dalila has become a friend and an example to all of our staff. She is not a believer, yet, but gives glory to God for what is taking place in her life and we hope that she accepts Jesus as her savior soon! Dalila is a widow and a mother of three. But more than that, this is a woman that had a great dream. That day Dalila did what the lady told her to do. Not knowing what to expect, she asked God for her dream to come true. One day, Dalila saw some land and she decided to ask for information. She just wanted to know if it was available. She left not only knowing that it was available but also knowing what she needed to do to get the land. She applied for a loan and she got approved. She was able to buy the land and start construction on the basic foundation of what would someday be a home for her and her children. 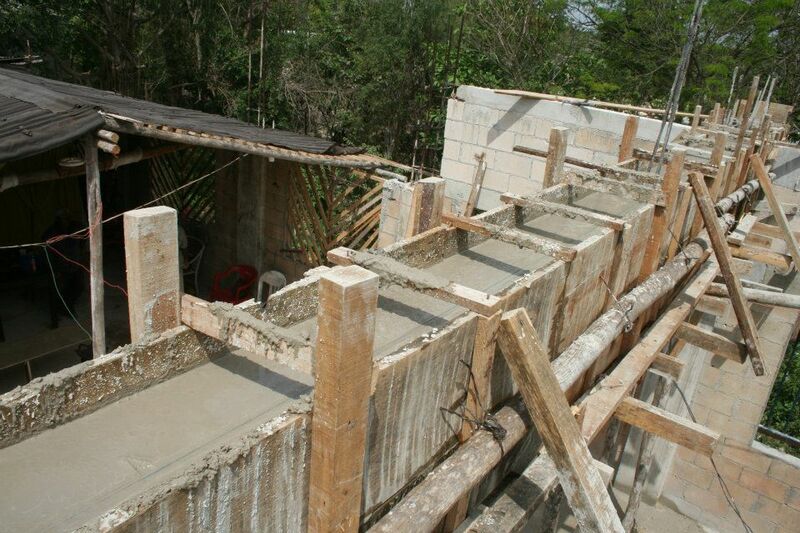 The next week Back2Back felt led to start partnering with her in the construction of her house. During this summer the groups that came to serve along side of us helped to make her dream a reality. This week we finished her house and had a house warming-dedication party. Her face was priceless during the celebration. When it was her turn to speak, the words could barely come out of her mouth. She was so thankful to God because He had heard her prayer and answered it. She is moving in on Friday! 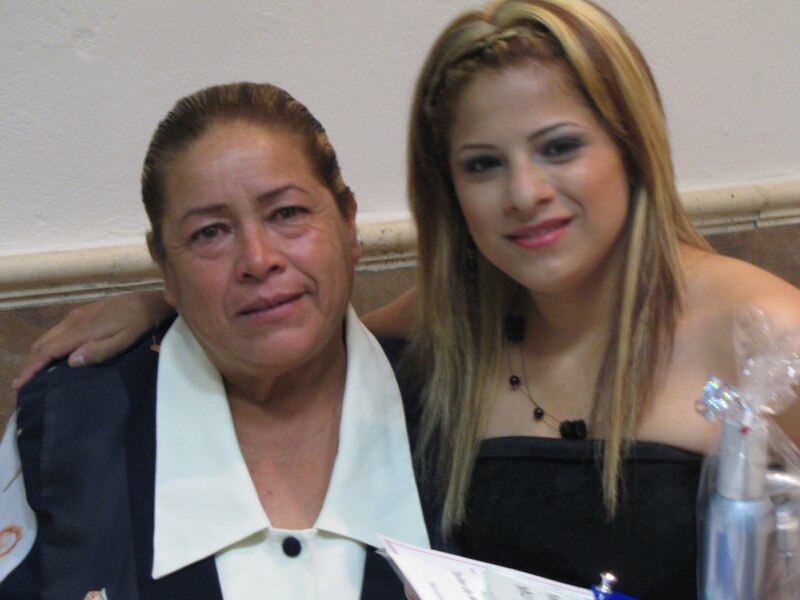 Dalila is an example for my life, because even after losing her husband and going through a tragedy, she never gave up. Most the kids from the children homes that we serve are there because it was easier for their parents to leave them then to fight for them, this could have been Dalila’s kids lives, but thanks to her perseverance, this family is still together. Please keep Dalila’s family in your prayers. Pray that this will only be the beginning of a great relationship with God and that they will never forget that the giver of all good things is God. I got a phone call from a woman last week that caught my attention. 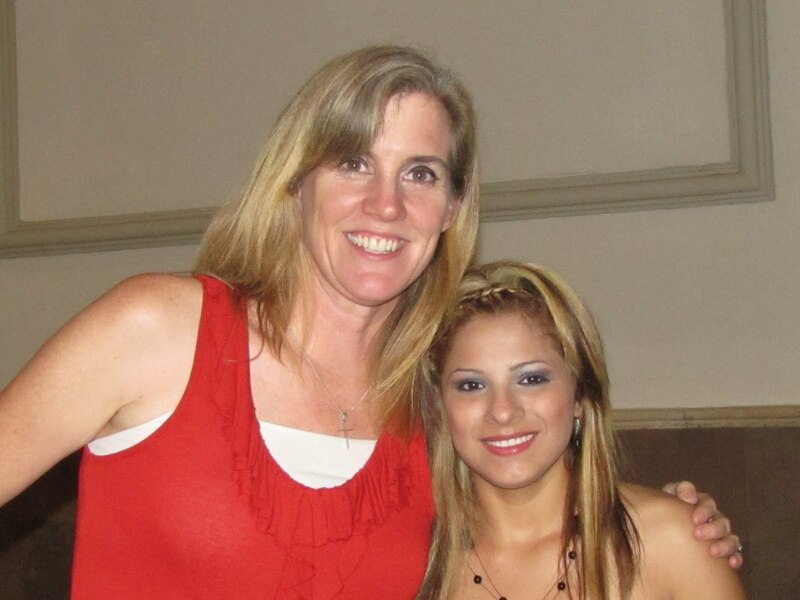 She had recently come home from spending a week in Monterrey with Back2Back and was interested in sponsoring one of the children she had connected with. Nothing too unusual about that. (If you met these kids, you’d probably call me too). What made the phone call unusual was that she wanted to come into the office to drop off her donation right away. Usually people will wait for me to mail them a Welcome Packet and send their first donation back through the mail. This woman couldn’t wait that long. That afternoon she came in with gift wrapped presents and a check book. She apologized for keeping me waiting (as if I should have expected her to come straight after we hung up the phone). As I sat down with her and started getting her all set up for sponsorship, she began to tell me her story. Her and her husband served with us in Monterrey because her son, who worked at a church, invited them. They had attended the church off and on, but the gospel was never real to them. While working with Back2Back in Monterrey, they met a teenage girl who had been abandoned by her family, yet put her faith in a God who loved her enough to send His son to die for her. That kind of faith, in spite of circumstances, opened her eyes to the reality of Jesus as Savior. Her and her husband came home and were baptized the following Sunday. She had written this orphan girl a letter, telling her the impact her faith had on her and her husband’s life. She couldn’t wait to get it to our office and begin sponsoring her. I was just blessed enough to be the one to pass that letter along. One of my favorite things about God is how His plans are so much better than ours. 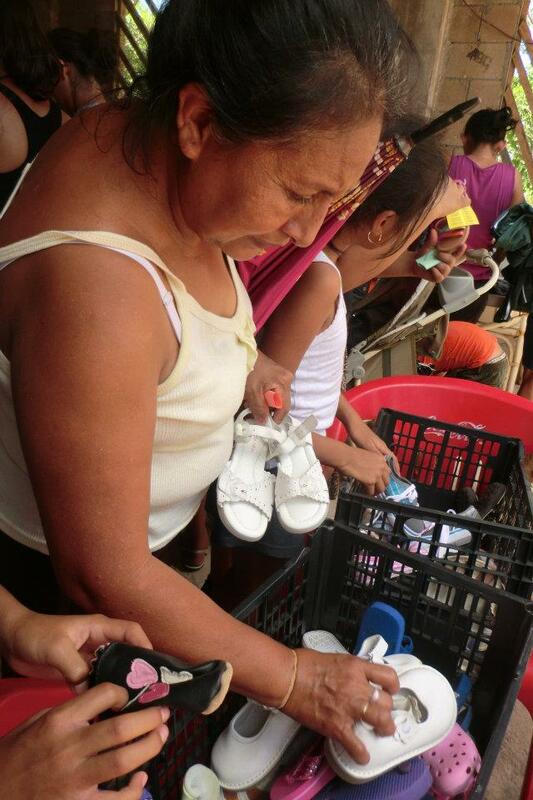 This woman thought she was doing God a favor and going on a trip to Monterrey to change the life of an orphan. God smiled at her good intention, and decided to do her one better. He sent the orphan to her to change her life. WOW! That’s how I need to start this post. Please read on and you will understand why. We are not posting pictures with this post, and while we realize that this certainly makes the posts harder to read and interact with, in some cases we do not have a choice as the children that we are writing about in this post come from dangerous situations and need to be protected. As a result, we are not permitted to share their photos, nor is it in their best interest to do so. We ask for your understanding as we continue to try to share with you their lives and what the Lord is doing here in Cancún. After a week of vacation, the first day back to work was a Wednesday. Wednesdays are very special because it is usually the day that we go visit the kids at CAT (a shelter for children in dangerous situations). CAT is a government program and for that reason they are not very open to the gospel. This summer we started VBS in all our ministry sites and we had a hard time thinking about how we were going to do it at CAT without being able to talk about God. The main idea for the VBS is that “Everything is Possible with God” (not easy to do without the word God). So Mau and Lizy, the captains from CAT, decided that it was time to have a conversation with director of the CAT about this. So Wednesday came and I didn’t know what to expect. I had heard that some changes had been made but I wasn’t sure what they were referring to. I was in charge of the games and my heart jumped with excitement when I found out that the doors had been open for the name of God to be said with freedom! I had freedom to tell these kids about the wonderful plan that God had for their lives, freedom to tell them that no matter their circumstances they could trust in God! And that wasn’t the best part. We finish the VBS singing the songs that we learned that day, after I tell you what happened you will understand why I had to start this post with the word WOW. These precious kids went from not knowing who God is to singing to Him the song called “OUR GOD.” If you have never heard this song before please listen to it. So the next day we had a field trip with the kids and guess what one of them said in his conversation with someone else… “With God everything is possible!” They are getting to know their Heavenly Father! It is amazing what God can do in one week! I remember that our first month in Cancun I posted a prayer request about CAT. That the doors would be open to the Gospel, and they have been opened wide! Thank you for partnering with us and making this possible. 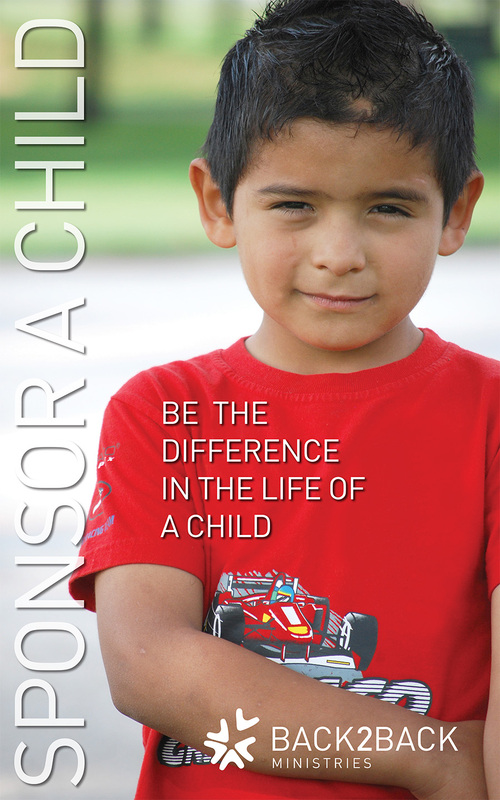 Who hasn’t heard or seen the promotions for sponsoring a child through global non-profit organizations? We have two girls with one of them and I know tons of friends and family that sponsor kids through these programs. 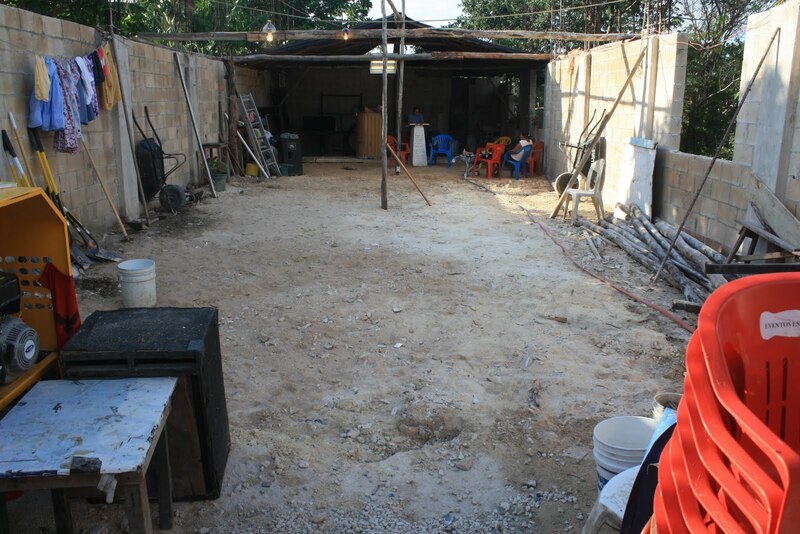 Because of a little party we had this week at Casa Hogar San Jose, a home that Back2Back serves in Cancun, Mexico. During one of our visits to San Jose this week, Anna and I were able to read letters to the kids from their sponsors and help them decorate and write letters back to them. The joy and excitement of the kids was transparently over the top. It got me thinking about and studying their behavior and reactions to the letters, to the words written by their sponsors, and about everything that these kids are able to do because of the sacrifice that their sponsor is making every month. There were two moments when it really struck me. 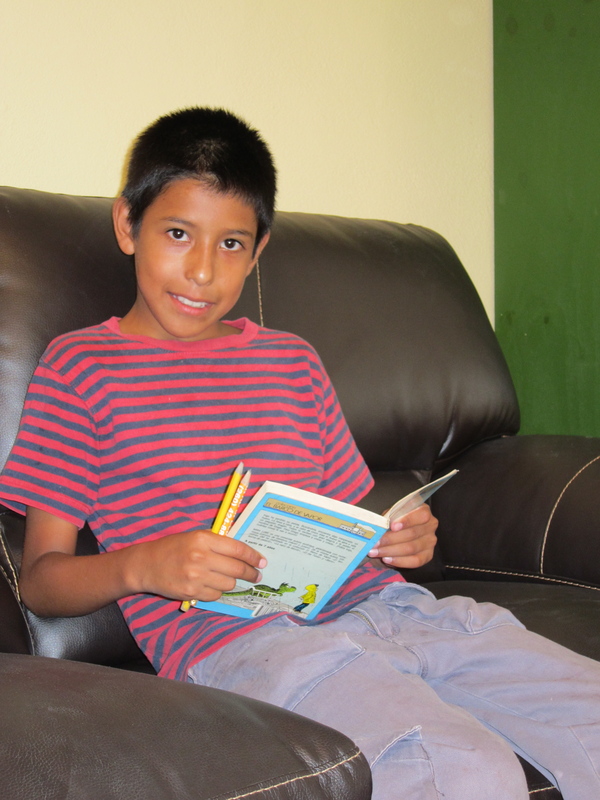 The first was when Jorge (9), was hunched over the table completely zoned into reading the letter from his sponsor. 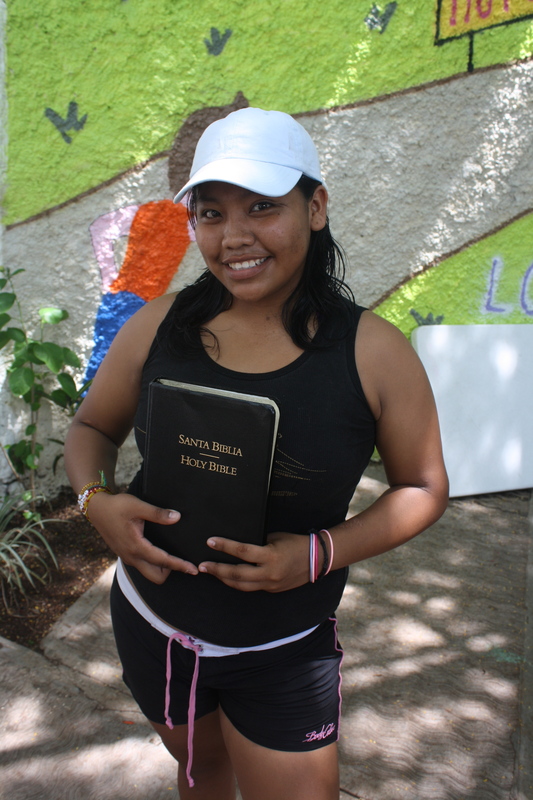 The other was when Sandi (14) was reading a portion of her letter out loud an laughing with Jimena (12). These two unique moments brought a clarity to my mind about the value of this precious communication and attention to these kids lives. The reality and strength of the bonds formed through personal letter writing and personal connection of having met their sponsors. And that is where, I believe, the first of the two major differences lies with Back2Back’s child sponsorship program. While the major organizations have a roughly 90/10 split of sponsors who have never met their children, Back2Back’s is just the opposite. The value of this personal connection is undeniable in the eyes of these kids. We are a unique and blessed ministry to be able to have so many children know their sponsors personally and be able to maintain that close relationship that was formed when their sponsors came on a short term trip with Back2Back and met them for the first time. 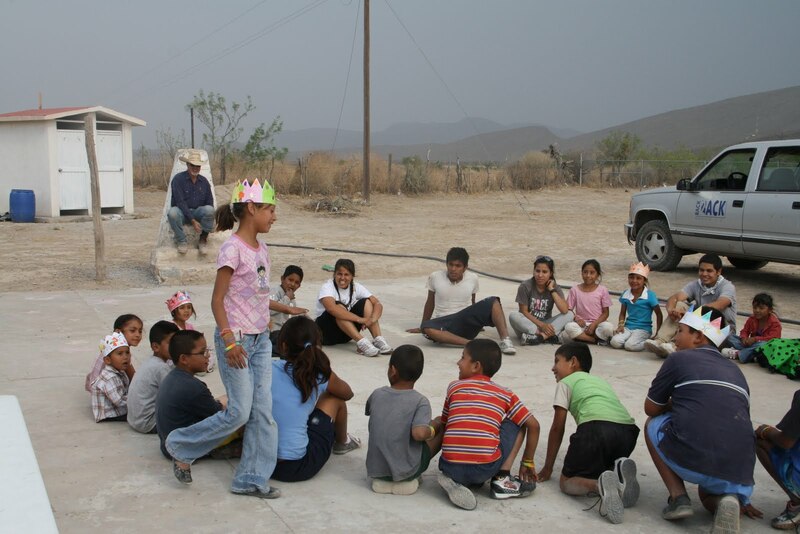 The second major difference, in my opinion, is the constant oversight of direct children’s homes captains and a team of ministry personnel focused on how to utilize each dollar of sponsorship donation to the utmost for the benefit of the whole child through Back2Back’s Child Development Model that is focused on the Physical, Spiritual, Emotional, Social and Educational aspects of their life. Because of Back2Back’s tireless commitment to transparency and devotion to learning more about how to go deep with each child, the sponsors know that their sacrifice is truly making a difference in every aspect of their sponsored child’s life. 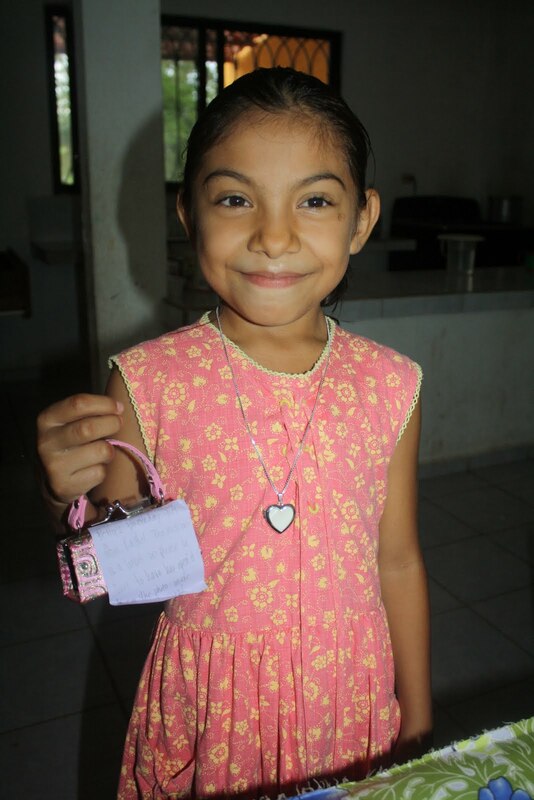 We just wanted to take the time to thank those who are Back2Back Child Sponsors and especially for those of the kids at Casa Hogar San Jose in Cancun. Your investment in these children is a daily reminder of our perfect Heavenly Father’s love and provision for those that He holds most dear. Thank you for being the hands and feet of Jesus and for being the difference for one of the 163,000,000 orphans in the world today. 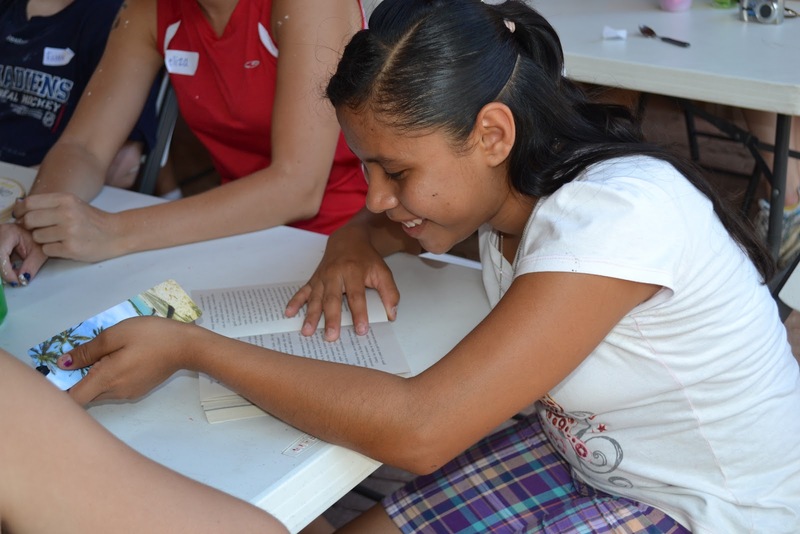 Please enjoy this video of our letter writing party this week at Casa Hogar San Jose on the north side of Cancun. 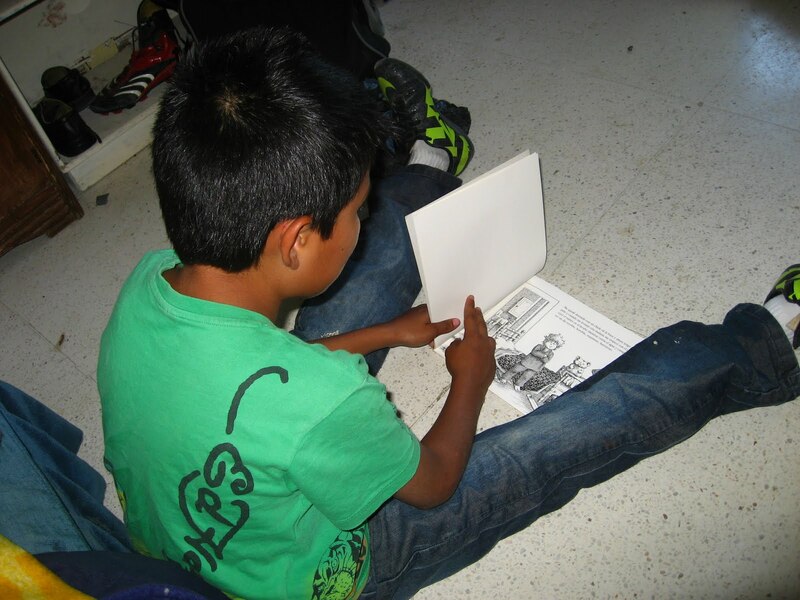 Within the past month, all four of the 4th graders that I work with at Casa Hogar Douglas (Douglas Children’s Home) have finished the first chapter book of their entire lives. We’re so excited to promote literacy among the children we serve through tutoring and development of libraries on-site at the children’s homes. This is truly a key to them having the tools they need to break free from the cycle of poverty. My excitement I think pales in comparison to how much this feat is boosting these boys’ confidence in their own academic abilities. I don’t think they had any idea that they were capable of reading such long books. Boy #1 just learned to read this past September. He hadn’t been enrolled in school for the past 2 years. Not only can he now read, he can read (really slowly, while skateboarding) chapter books on a 3rd and 4th grade reading level. He genuinely likes to read. What started with Dr. Seuss, has now progressed into chapter books about pirates in space. Boy #2 now gets more excited when I bring news of new books arriving from the states for him to read than when I buy new movies. He’s the strongest reader out of the 4 boys in his grade that live in his dorm. He’s come a long way from where he was last year in reading. Boy #3 can barely read. I mean, he can read but it’s painful at times how slow he reads. In 15 minutes, he might read 3 pages. He still tries to cheat his way out of reading for the allotted time by just counting out loud to try and trick me that he’s really reading. 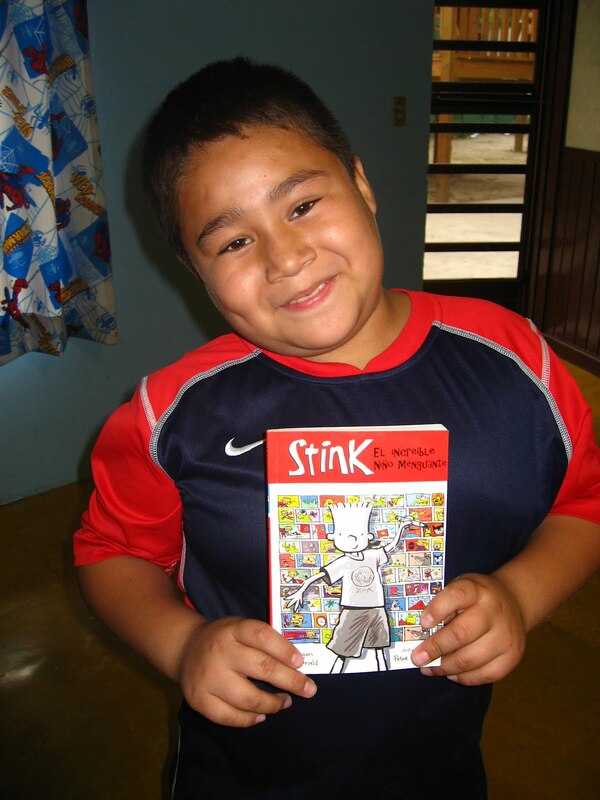 But he has now read two of the Stink books and is unbelievably proud of himself. Fourth grader #4 is a special, special child. He has some rather intense behavioral outbursts at times. He doesn’t usually do well in school and he has severe speech problems. On the days that I’m responsible for him, I’m lucky if I can get him to do half of his homework without throwing a fit. He’s multiple years behind in school but this blessed country keeps passing him to the next grade. This pass month though, I believe I’ve witnessed a miracle. He loves to read the Diary of a Wimpy Kid books! When his required 15 minutes of reading is up, he keeps reading. He laughs hysterically as he reads and then runs to read the same joke on the page to another kid. We had a party just this past week when he finished the first book in the series by watching the movie that’s been made after the book. He was so excited to watch the movie that he even invited his older brothers to watch with us. He is currently reading the 2nd book in the series and when he finishes, I’ve promised to buy the 2nd movie. I’m so proud of them and so thrilled for their futures. For whatever reason, each one of the stories being written in history for these boys involves the part where they grew up in an orphanage. The statistics are not pretty for how the stories of people who got their start in an orphanage usually end. I usually find myself praying against what seems like ridiculous odds when I remember them individually in my prayers. But what I’m physically seeing right now is an obvious answer to my prayers from over a year ago. Seeing and hearing them read and laugh and love what they are reading is one of the most beautiful things I’ve ever witnessed but it doesn’t compare to seeing and hearing them worship with all they’ve got. They yell it out whether it’s to a CD, a worship DVD or at church. And they’ve got some awesome air guitar moves. Three years ago, I don’t think any of them knew a worship song. Better things are yet to come at Douglas my friends. 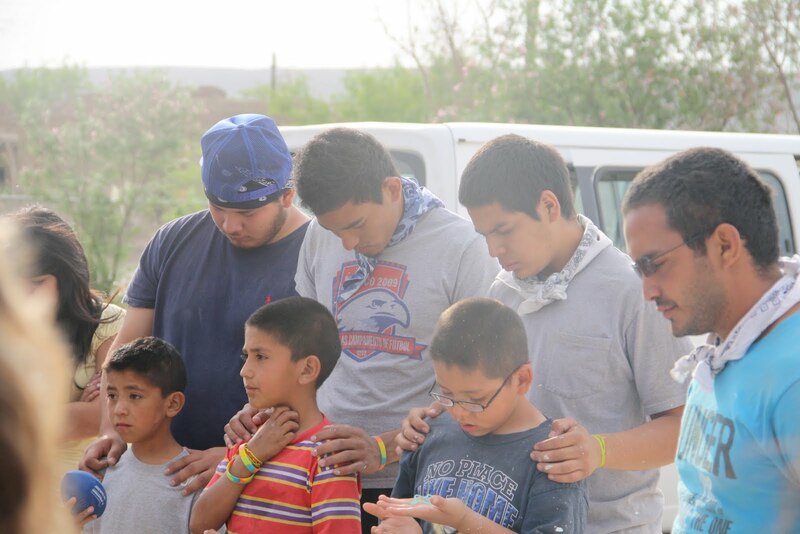 Join me in praying that Angel, Guillermo, Cesareo and Gustavo grow up to be some mighty men one day. As humans, we learned to rely mostly on ourselves and our planning. During this time of training we are learning that no matter how much we plan, we have to remain open to throwing our ideas out the window for God’s plan. 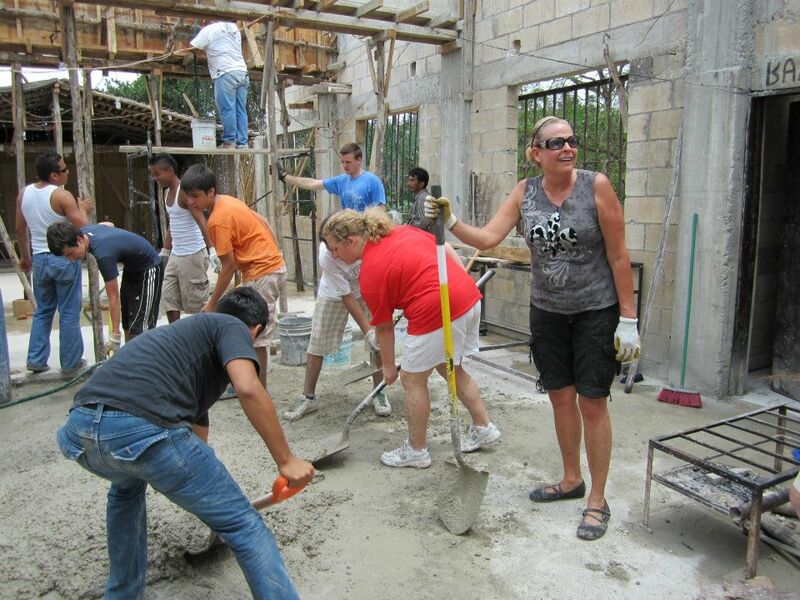 A few weeks ago, a group from Grand Rapids, Michigan was serving with our Back2Back Cancun staff and during this particular day, nothing was going the way that we had anticipated. We were doing a concrete project that, according to our plan, wasn’t getting finished since we didn’t have enough man power. God’s better outcome: We finished in record time! No explanation, but with fewer people and less that were able to do the physical exertion, somehow we managed (through God’s miraculous help) to do it quicker than ever. This was my first time translating for a medical clinic and I didn’t know what to expect. We went around the community telling people to come over around noon. We didn’t find many people outside or at home and it seemed like the clinic was having a slow paced day. God’s better outcome: We saw 28 people. Most of them went home with the medicine that they needed to get better. I had a great time getting experience in the medical arena. The doctor was patient and kind with me and the people that we saw. 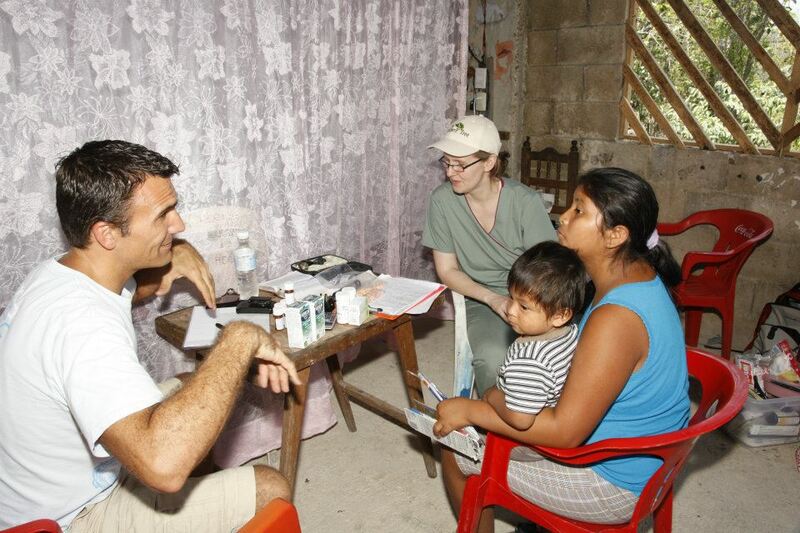 The people of Tres Reyes benefited greatly from this medical service. Usually when we visit this particular community called Tres Reyes (Three Kings), we finish the day of work with a prayer walk. God’s better idea: We finished praying for pastor Victor and his family (We partner with his church as a main contact in this community) and another family that helped us finish the project. It was a time of blessing and healing. It is amazing to see God’s hands in and on everything we do. Every time He takes control, everything turns out perfect. We have been on the ground in Mazatlan for two days now and as always words can’t adequately express the work Back2Back is doing and the ways God is showing up. One of my greatest joys is watching God move on the team and I’m just thankful …I’m able to be a part of it. Today, we worked at a children’s home at The Salvation Army and we witnessed a young girl get dropped off. She never came outside to enter act with us, but she was extremely emotional. I can’t imagine what was and is going on in her mind… Did she get kicked out? Did her parents split up? Did she have nowhere else to go? What will she be thinking tonight sleeping in a strange place where she doesn’t know anyone? How long will it take her to start to open up to someone? How will this affect the rest of her life? Is this something she get over? Then the I wonder how this will affect her relationship with God… Does she even know God? How will God redeem this? So many questions and so many thoughts run in through my mind and I can’t imagine the thoughts running through hers. Now we are back at the house and all the way back I couldn’t help but think about my kids and my family. I’m so thankful and grateful for what God has given me. I pray I live my life as the best possible steward of what God has entrusted me with. God come and pour Yourself out on the team during our remaining time here. Last December I wrote about a boy named David. 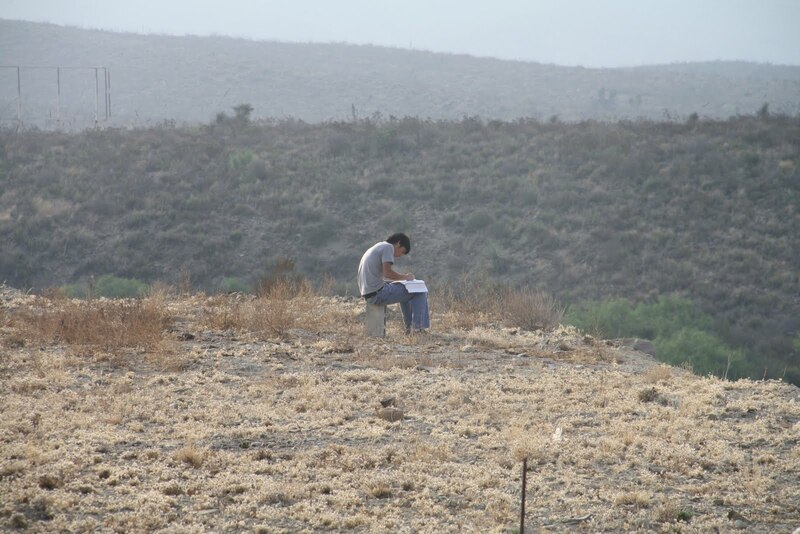 Fifteen, no desire to work, or study, or follow rules…and you can guess where that got him. David had a lot of things going on – both inside and out. He has lived at the children’s home since before he could walk. The only family he has ever known is his older brother, and the directors of that home. For lots of reasons, it is no wonder that his life might look a little messy, yet even in the midst of all that, God was giving me just a glimpse of the potential that was inside this boy. I knew that God had a lot more up his sleeve for this young man. What I didn’t know, but could have guessed is that life would get worse for David before it got better. I did have a few chances to hang out with David in the winter and spring. We invited him to join in with us a couple different days when we had visiting missions teams, and he came along as a volunteer for the day. He was pleasant, helpful, fairly quiet. One morning I grabbed him and sat down beside him while the visiting team was having their quiet time and I read Psalm 139 to him. I told him it was one of my favorite places to re-visit in the scriptures, and how I loved how full it was of truths about God…how He knit us together in our mothers wombs, how He knows us, how He is always with us…and the list goes on. About a month later David left the children’s home He lived the next six or seven months on his own, in a tiny cave-of-a-room with a mattress in it. He hit some real lows. And somewhere in the lowest of low places I think David started to believe that there just might be something to “this God” and what this God had for his life. As the months went by we knew little of David. But thanks to the modern wonder that facebook is to all of us, from time to time I was able to shoot him a message, and let him know we were praying…but that was about it. But rarely would I hear anything back. And then, all of a sudden, in mid to late November David initiated chatting with me via Facebook one evening. “I want out,” he said. “Out of what,” I asked? “Out of my life. I don’t want to live like this anymore, I want out,” he said. “Let’s figure out when we can get together,” I replied. I suggested he meet us Sunday morning, come to church with us, and we can spend the afternoon together, but Sunday came and went. 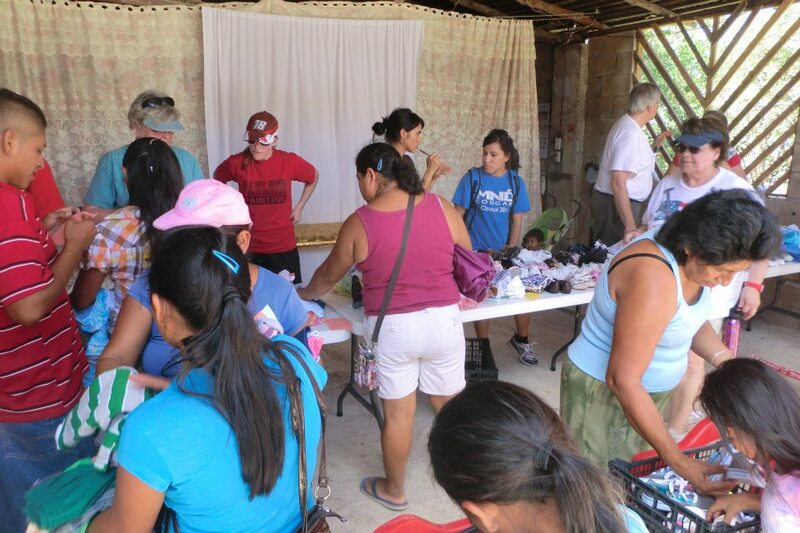 We didn’t hear anything from him, and then, well then we got busy with a visiting group of 20-some women here from Ohio bringing Christmas cheer to Cancun. So, Wednesday, November 30th rolls around. It had been a long day. It was about 11:30 p.m. We had just begun to drift off to sleep when the security from our neighborhood called to say there was a teenage boy at the gate looking for me. “It’s David,” I exclaimed to Julie. “Well, have him come in and sleep on the couch and we can talk more tomorrow,” says my compassionate wife, Julie. And so I walked to the gate, and escorted him to our house. I got the feeling he was already planning on staying as he immediately took off his shoes and socks. “What do you need – what can I do for you?,” I asked him. “I want to change. I want to be different. I want to go back to school. I don’t want my life to go on the way it is,” he replied. “We can help you find a place to live, and we can help you get back in school, and we can help you get pointed in the right direction, but you have to understand that what you need more than anything right now is God. Do you understand that? Can you see that?,” I asked. “Yes, I know. And I’m ready,” replied David. In the morning I remember waking up and thinking. Yep, it’s true, it’s not a dream. David showed up at our house last night, and he’s sleeping on the couch. Why now God? We have 20-some women here for the rest of the week, don’t I have enough going on right now? How will I have the time necessary to devote to him today. Silly me, I should have known that God already had that all figured out. As God’s schedule would have it, that morning had been carved out for the women to have their quiet times with the Lord, and their small groups at a local beach before we headed out to serve for the day. Right there, and right then David and I prayed together, and he gave his life over to Jesus. It was one of those surreal moments, witnessing God do what He does, and yet being right there in the midst of the whole thing – what a gift. Our Cancun staff team, as well as the other visiting staff from Ohio and Monterrey then gathered around David, and spent the next moments bathing him in prayer, praying for his protection, praying for what is to follow – and entrusting the days that are to come into the hands of God. 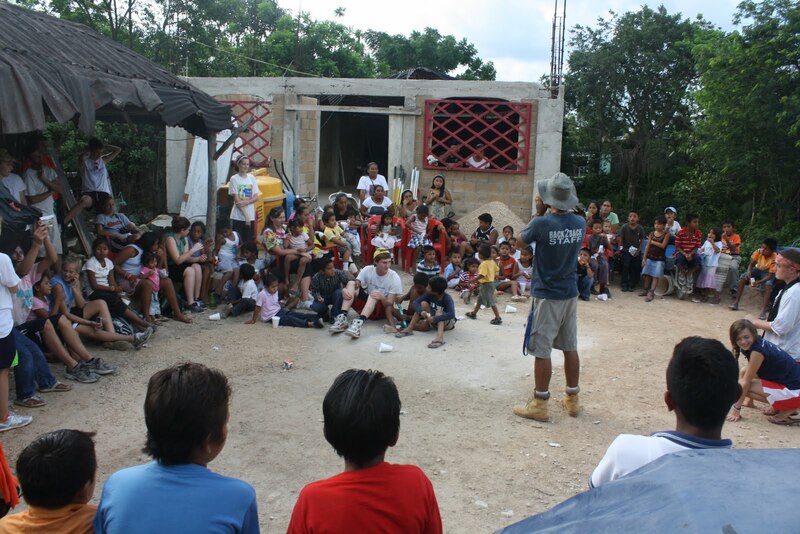 A few months ago, I was hanging out with a few girls in the Rio, an impoverished Mexican community that Back2Back serves. We serve these families, mostly single moms, because they are literally at the cusp of making the difficult decision of whether or not they will choose to place their child in one of the children’s homes. 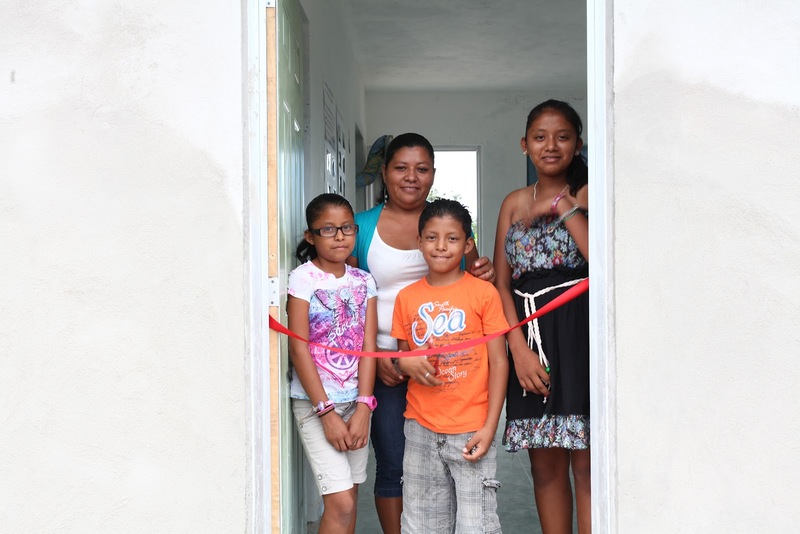 Our goal is to help them to provide for their children’s basic needs, preventing them from reaching the point where they need to drop off their children at one of the homes. At one point, my conversation with the girls turned to the topic of reading. I asked them if they ever get read to at home. They both said no. I knew both the girls had several books in their home, because I had brought them out in a donation. I asked the girls where they books were and they said “on the shelf.” I praised them for this, because taking care of items in the Rio is not always a priority. We had a conversation when I first brought the books out about where to keep them and how to care for them. So I was pleased to see that they had done this. However, when I asked how many books the girls had read that week the answer was, zero. When I asked why, they reported that they weren’t allowed to take them down from the shelf because their grandmother knew I was going to come by and she didn’t want to take a chance that the books would be ruined before my next visit. I sighed internally as I realized that this family didn’t understand the reason for the books. I remembered the library programs that I participated in as a child growing up in Oxford, Ohio. 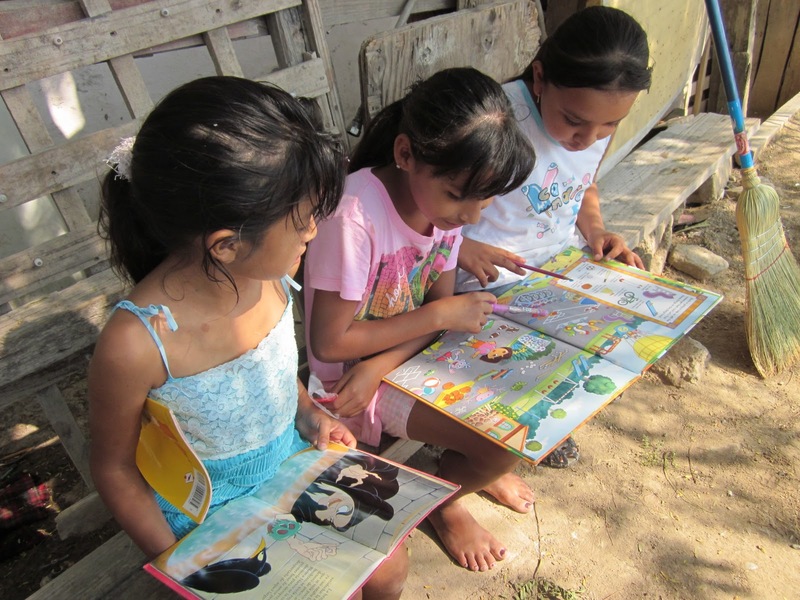 Almost every summer we would set reading goals and earn prizes for the books that we read… I wondered if Sara and Monse needed a little motivation like I did when I was little. I asked for a scrap of paper and scrawled out a one week reading chart for the girls. “Try to see if you can read one book a day or if your grandmother can read one book a day to you for the next week,” I said. For added motivation I let the girls borrow some of the children’s books I had with me in my car. 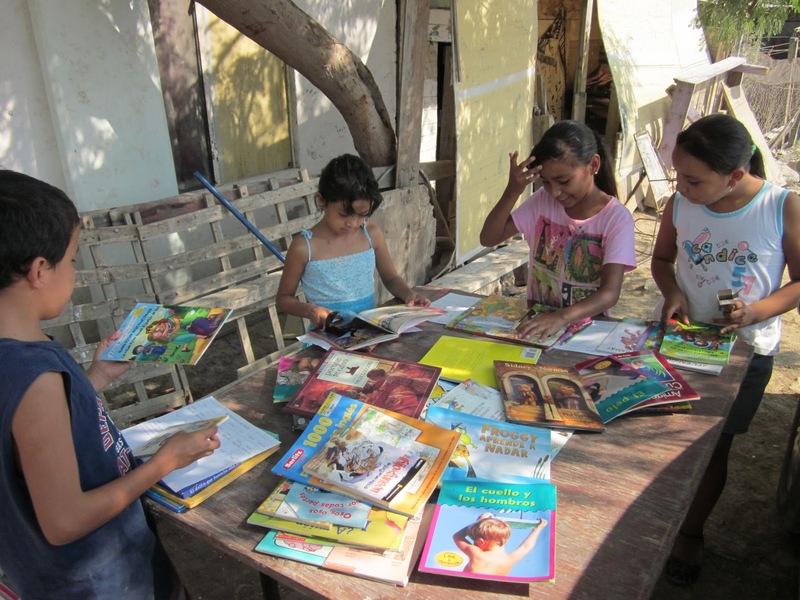 “Next week when I come, show me what you have read and you can borrow some more books.” I then talked to their grandmother to make sure she understood that the books were for the girls to read, regardless of whether or not they got messed up. The next week I drove up to Sara and Monse’s house and was greeted by the girls proudly standing outside holding up their reading charts. “We did it every day!” They shouted. Each girl got to pick a lollypop as a prize then we sat down to talk about the experience and to read a book out loud together. It was wonderful! The next week even more kids showed up and the same thing happened the week after. I now have about six consistent students every week! I set up a very basic library system, where the kids can check out and return books. 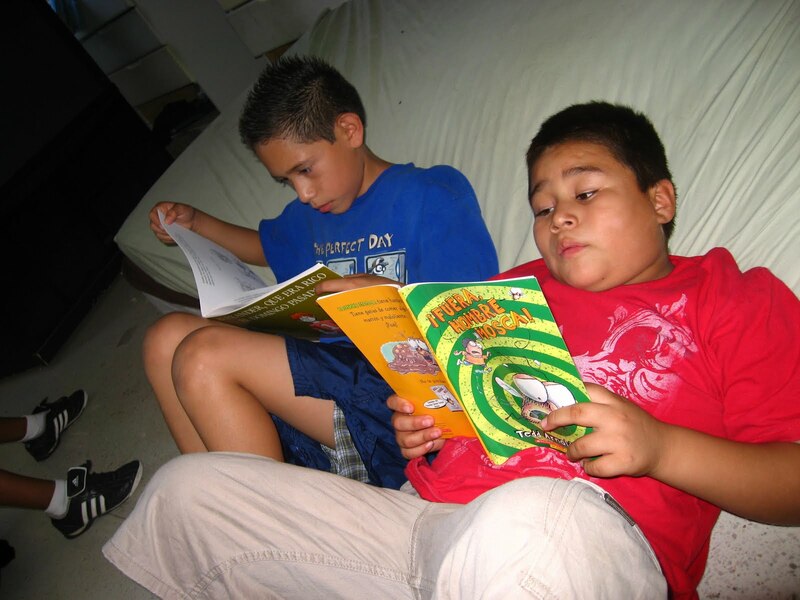 The best part is that the kids are reading or being read to and that there are books entering their homes. I’ve even noticed some of the teenage boys standing at a distance where they can hear the story I’m reading to the children yet still look cool! They were only given away when they too started laughing at the funny parts. 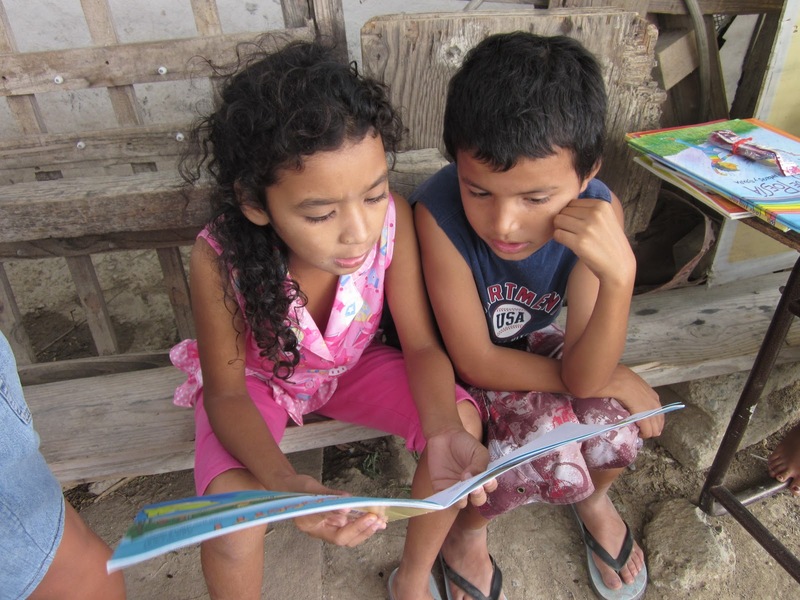 Children in the Rio are excited to be a part of Back2Back's new literacy program. I have several Christian books and some children’s Bibles that I let the kids borrow. Sara told me one day that her grandmother loves the Children’s Bible best of all.She reads it everyday to her granddaughters. Yajiara borrowed a Max Lucado book one week that illustrated the story of our Heavenly Father’s love for us. She said that her mom started reading it and loved the story. Her mother read it over and over several times that week. I’m excited to see where this literacy program goes! Two months later and the kids are still excited about reading. I can already see that he kids are enjoying reading and that their parents are being influenced too. Compared to when we first started, the children are now very engaged in the stories I read aloud. They are making their own predictions and making connections to the text… two very important skills for readers to know. I also love to see them being responsible for the books they check out. We have only misplaced a few! They have read most of the books in my collection and I am in need of more! The children select the books they want to borrow for the week. Monse, Sarah and Alondra read together. Please keep us in your prayers! Pray for the kids’ enthusiasm to continue to grow as they discover the joy of reading. Pray for the ones who struggle with reading to continue learning. Pray for parents to continue to be on my team with this. Pray for more children’s books in Spanish. Pray for me to have wisdom to know how to teach and encourage these kids. Merry Christmas from Back2Back Ministries! Ephesians 4:4-7 says, “We are all one body, we have the same Spirit, and we have all been called to the same glorious future.” This Christmas season, we are grateful for you and your commitment to joining us in providing care for today and hope for tomorrow to orphans around the world. We rejoice that we serve a God who is in passionate pursuit of the orphan child. 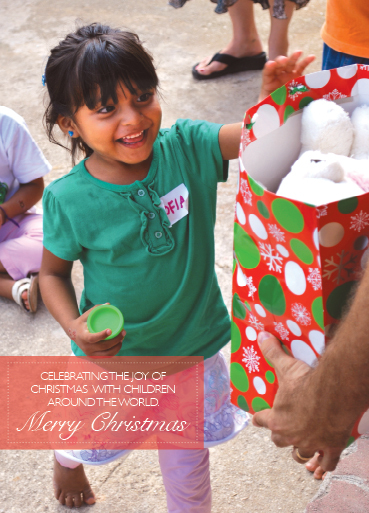 As you gather with family and friends to celebrate, thank you for continuing to remember the orphans we serve. On behalf of all of us at Back2Back, thank you for being a part of the Back2Back family and for serving alongside us! As a medical team of forty-six people invaded our campus for three short days, we witnessed a new meaning for our mission of bringing “care for today, hope for tomorrow” or orphans and children in need. 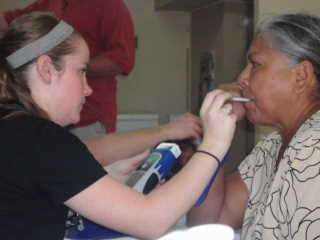 These doctors and nurses met immediate needs, such as prescribing medicine for runny noses and sore throats, while also providing comfort and reassurance to those with fear of a future with diabetes. It was a marathon of a weekend, but it allowed many individuals who had never seen a doctor in their lifetime to receive answers and medicine, making tomorrow seem more hopeful. It was a blast to have an entire “medical army”! I loved witnessing them use their talents as they furthered the Kingdom – one runny nose at a time. 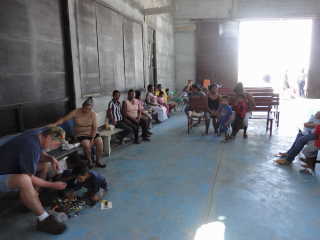 The waiting area quickly filled with families in need of medical care. Volunteers engaged with the children who were waiting. Chrissy, a recent nursing graduate from Malone, was eager to use her nursing skills to give back to those in need. 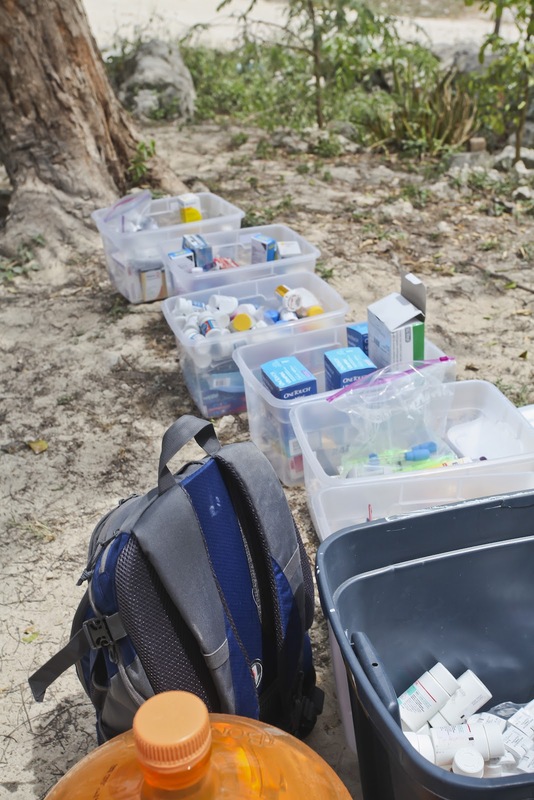 Patients visited the make-shift pharmacy at the end of their visit. 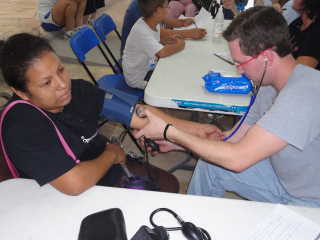 Thank you to the medical team from Ohio and Florida, sponsored by tjhe Juniper Tree Foundation! The Juniper Tree Foundation is a non-profit organization that is dedicated to assisting orphans and widows in need. 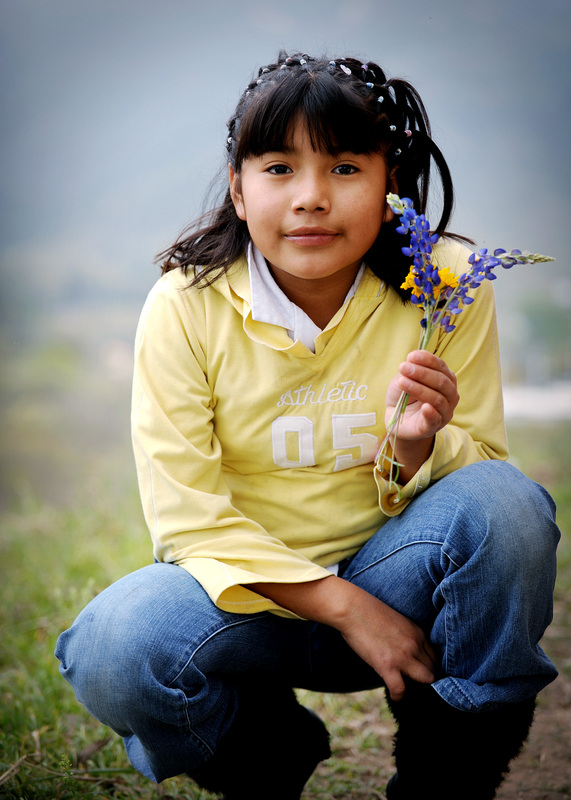 In October 2008, through a grant from the Juniper Tree Foundation, the Juniper Tree Clinic was established on the campus of Back2Back Ministries in Monterrey, Mexico in order to meet the physical needs of the children served by Back2Back. 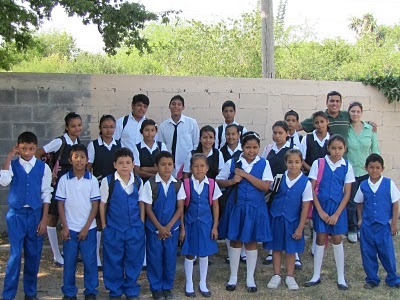 Back2Back Ministries is an international Christian non-profit organization that provides care for orphan children and impoverished people across the globe, serving over 1,000 orphans and families in Monterrey alone. The orphanages that Back2Back and the Juniper Tree Foundation serve lack funding to offer the children basic medical care, such as routine check-ups and dental visits. 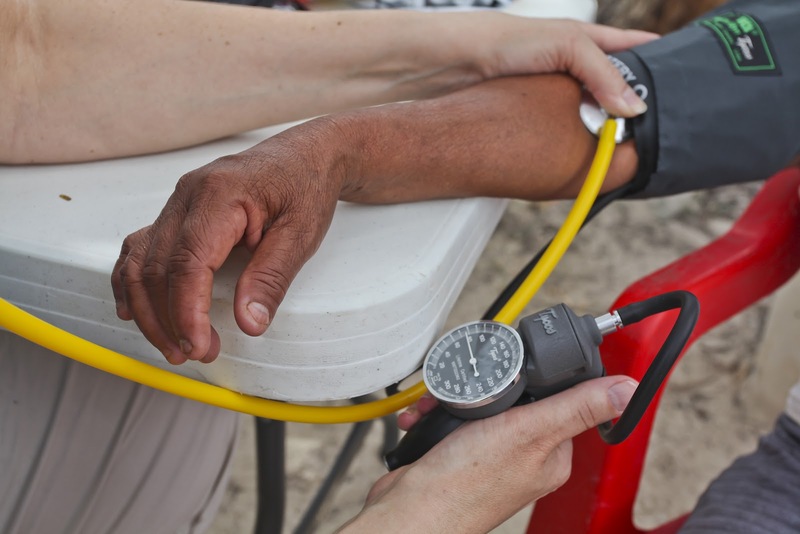 Most illnesses are left untreated unless they are extremely critical. For many of the children, their only access to medical care is through the Juniper Tree Clinic. The Juniper Tree Foundation facilitates opportunities for American medical professionals to meet this practical need, by participating in short-term medical mission trips, providing vital services to orphans, as well as impoverished families in surrounding communities. Happy Thanksgiving from your friends at Back2Back Ministries! 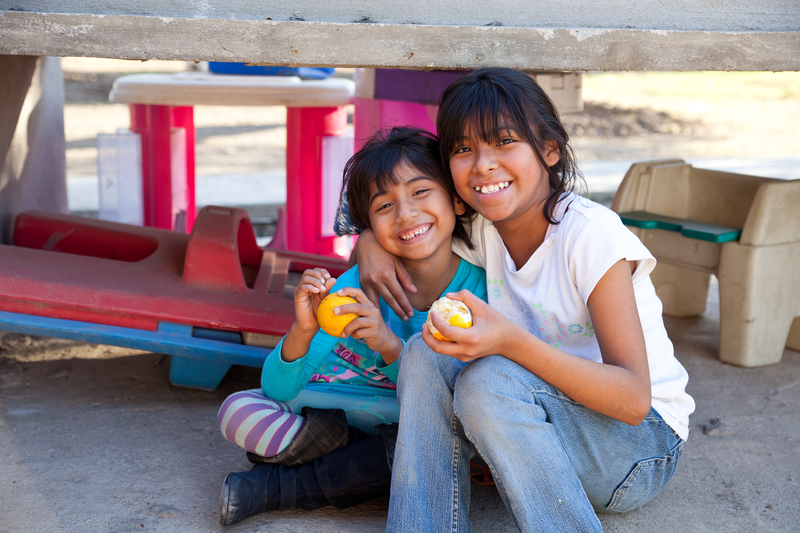 Two orphaned children in Mexico benefit from a nutritious snack thanks to the support of friends of the ministry. Happy Thanksgiving from all of us at Back2Back Ministries! We truly cannot praise God enough for the ways in which He has blessed and provided for our ministry this year. These successes would not be possible without your commitment to partner with us. As we look toward the future, we are excited about how God is working through Back2Back Ministries and thankful for your willingness to come alongside our work. Please know that you are a part of our Back2Back family and we truly appreciate your love and support of the orphan child. Please keep the children we serve in your thoughts and prayers this holiday season. 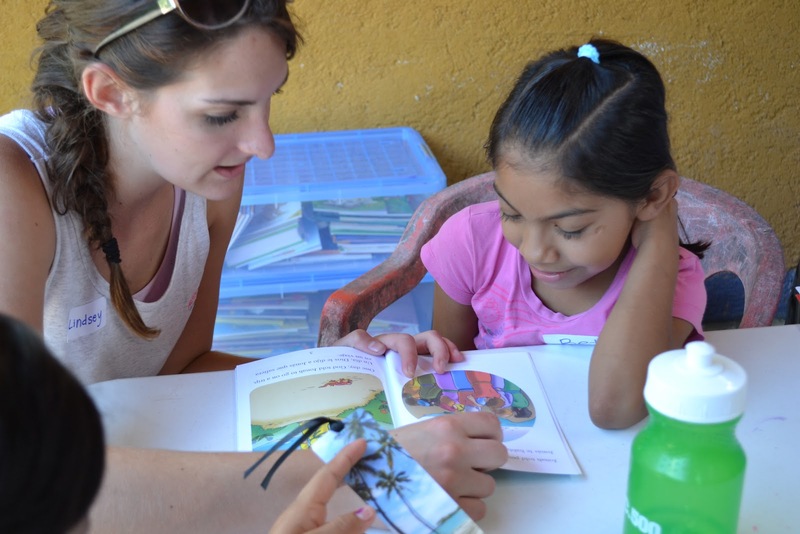 The opportunity to serve in Mazatlan has come through our ministry partnership with Riverview Church in Lansing, Michigan, who has been supporting and taking trips to children’s homes in Mazatlan for a number of years. As Back2Back has expanded its ministry sites, we have created a process for new site development, which is a strategic approach to thoroughly researching the site and prayerfully considering our calling there. Back2Back has taken two exploratory trips to the area and we feel like God has orchestrated and ordained our visits there. 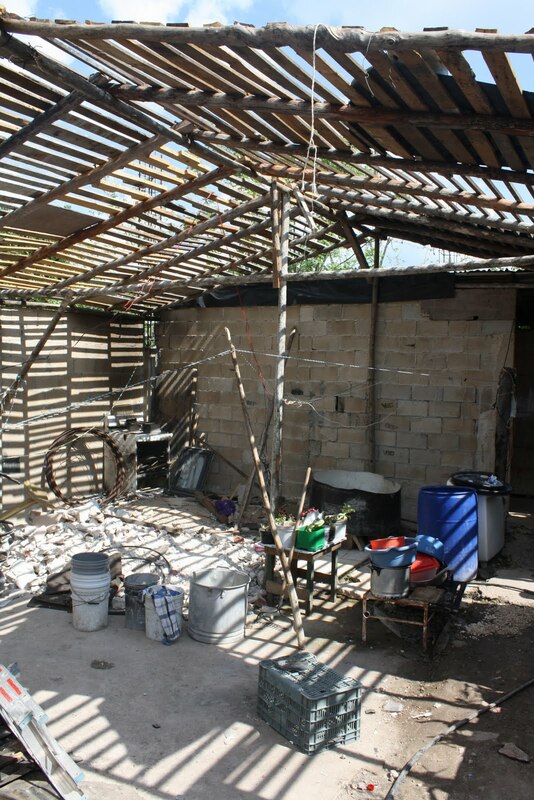 We know of six children’s homes in the Mazatlan area and have visited and begun relationships with the directors and caretakers in five of the six homes. The directors and caretakers all share a deep love of God and a deep desire for the children in their care to experience a brighter future. We have also made a connection with a social worker from the DIF, Mexico’s Department of Children’s Services. 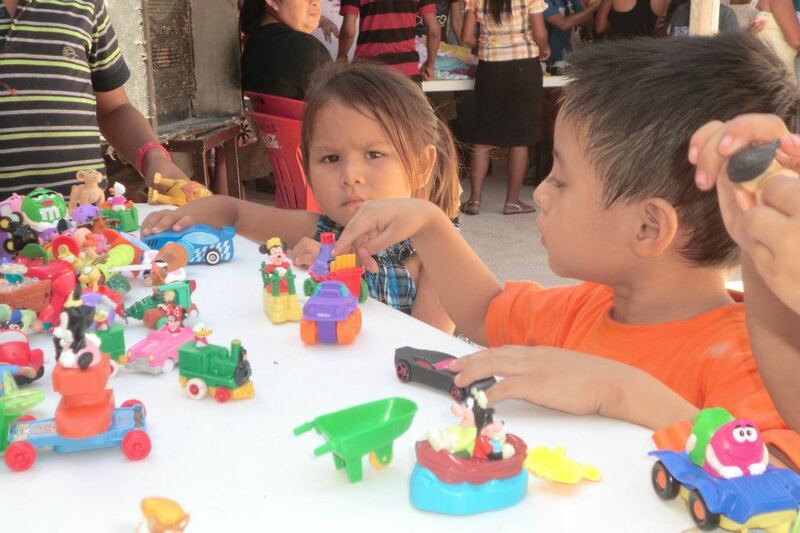 the needs of orphans in Mazatlan. 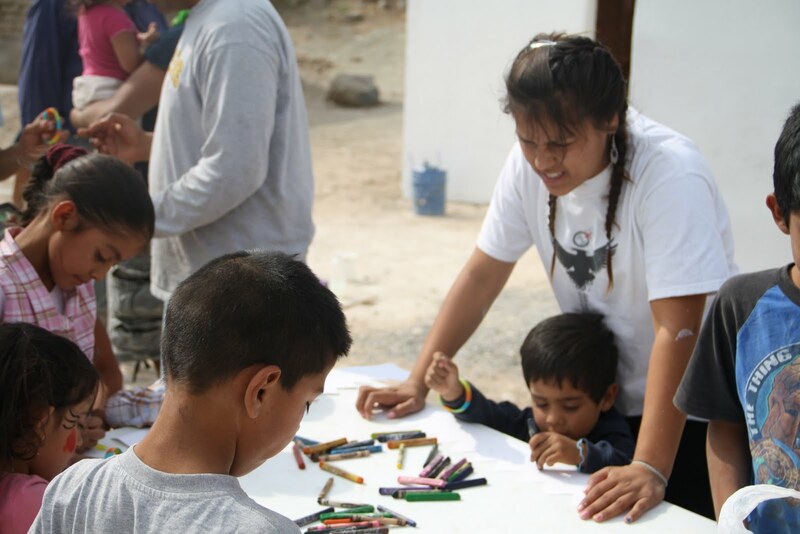 This fall, two boys from one of the children’s homes there, Rancho de los Niños, will be coming to Monterrey to be a part of the Hope Education Program. 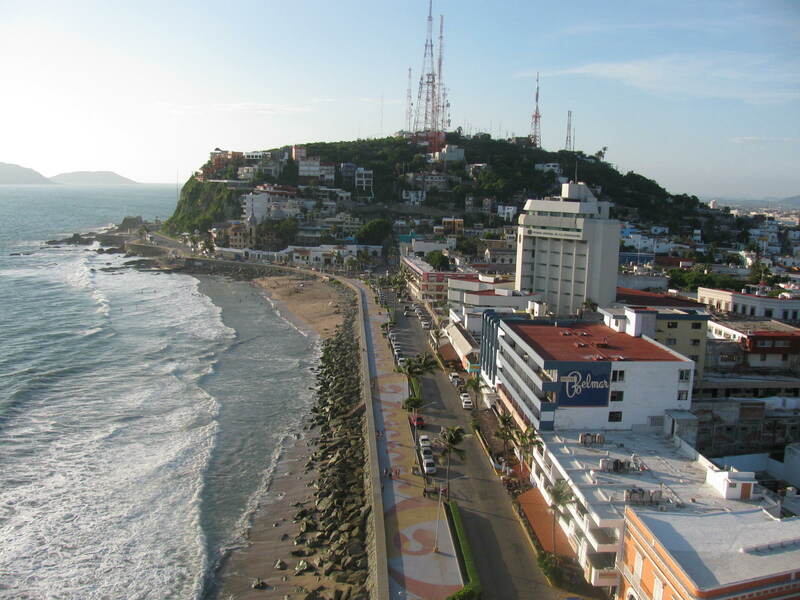 This fall, Back2Back is making decisions about staffing for the new site, contacting possible partners to champion the ministry in Mazatlan, taking another trip to Mazatlan to look for staff and mission team housing, and continuing the relationships with the children’s homes. 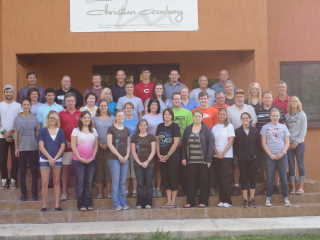 The goal is to have staff on the ground at Back2Back Mazatlan the beginning of 2012 and hosting mission teams of up to twenty-five individuals. 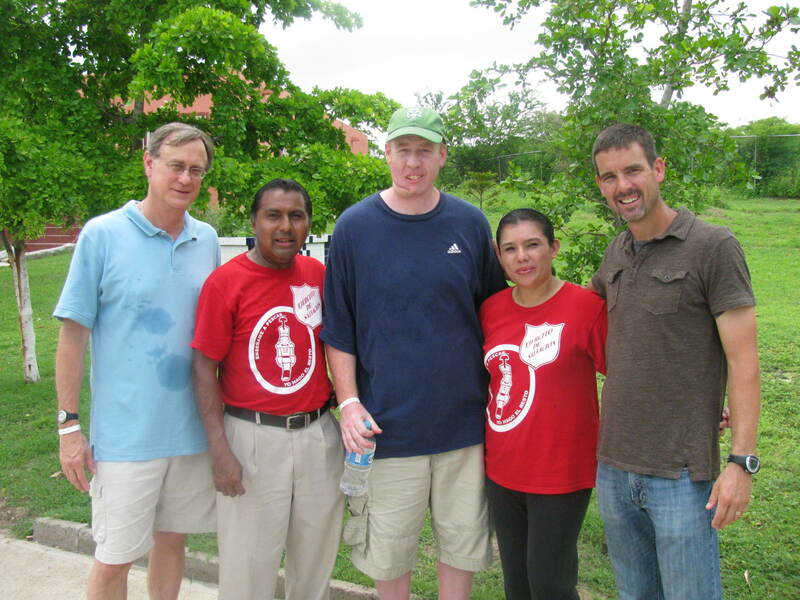 If you have questions or would like to know more about how you can partner with Back2Back Mazatlan, please contact J.J. Lail at jlail@back2backministries.org or 513-250-8296. MASON, OH – The Evangelical Council for Financial Accountability (ECFA) announced today the accreditation of Back2Back Ministries of Mason, OH. Back2Back Ministries joins a growing number of Christ-centered churches and ministries across America, supported by over 35 million donors that have earned the right to display the ECFA seal. When an organization is accredited by ECFA, it demonstrates its willingness to follow the model of biblical accountability. “We are pleased to include in our membership a ministry committed to being a voice for orphans and poverty stricken people,” said Dan Busby, president of ECFA. Founded in 1996, Back2Back Ministries (www.back2backministries.org) exists to love and care for orphans and impoverished children by focusing on the whole child in meeting their physical, spiritual, educational, social and emotional needs that they may overcome their life circumstances and break free from the cycle of generational poverty, so each one experiences restoration to a life of purpose, becoming fulfilled, mature Christian adults. To learn more about Back2Back Ministries and their stewardship opportunities, visit ServantMatch®, ECFA’s program that matches God’s servants with the stewardship options of ECFA members based on ministry sectors and categories. It is ECFA’s newest online feature that allows you to quickly and easily find giving opportunities. I’m sure that you’ve heard a million times that reading is fundamental to learning. Imagine a 3rd or 5th grader trying to tackle his math word problems for homework but has no idea what the problem is because he can’t read so he waits for you to read it to him and help him set up the math. This scene is far too common place for me to stomach sometimes. But orphans in orphanages don’t always get the amount of individualized attention they need to succeed academically. This is a huge deal when you consider that the ticket out for these kids is their education. Day after day here at the institution I work at, seeing the night and day difference between my academic upbringing and the snip its of time orphans receive for reading instruction – if at all – got me thinking. Add to the situation the fact that public libraries in Mexico are a foreign concept for the kids. I am in charge of different dorms of kids on different days so I decided about a year ago to start incorporating reading into my day with the boys. It was easy with the little guys because they love sitting in your lap and hearing a story read out loud but I was nervous about the 9 to 12 year old bunch. They have surprised me because they actually love it. They laugh as they comprehend funny parts of the stories. They smile. They don’t hate reading like I thought they would. We read out loud for 20 minutes. These 20 minutes which can sometimes go on for an hour when certain boys want to take their 20 minutes of reading individually by reading out loud to me is honestly my favorite part of my entire day with this dorm. Many of the books that we read on a weekly basis have been donated my several of you. 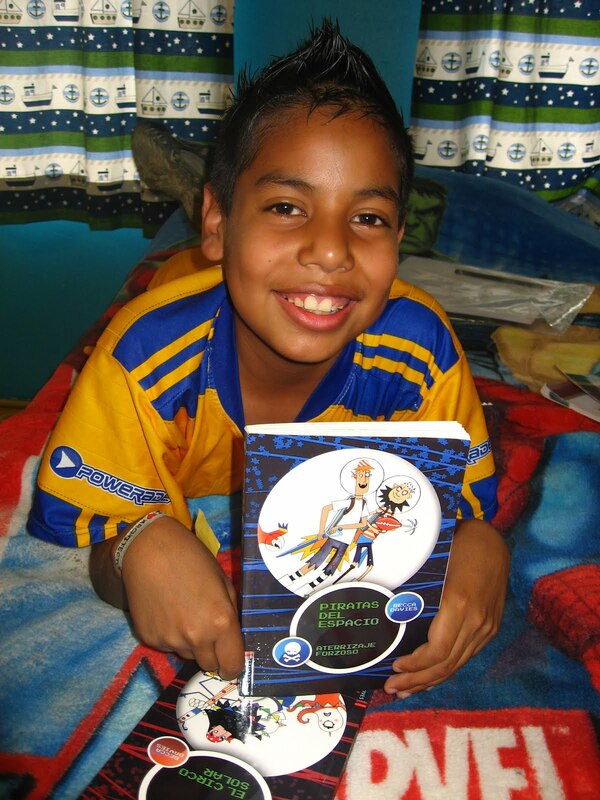 Thank you for shopping online or in bookstores for children’s books in Spanish. Thank you for donating to these childrens’ future. This beautiful little girl is Betty. She is nine years old, and is one of the sweetest girls you’ll ever meet. 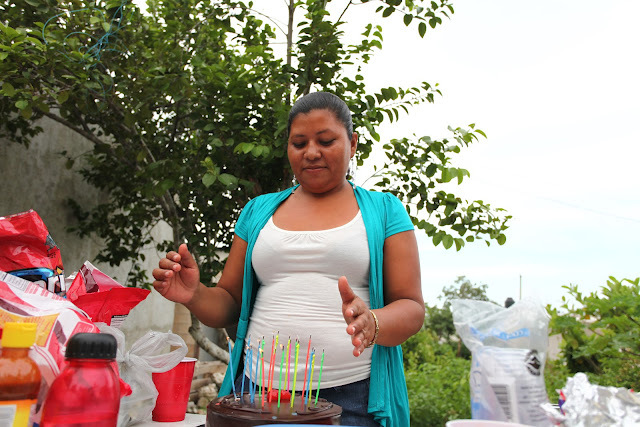 She is the oldest of three sister who came to live at Casa Hogar San Jose almost a year ago now. In December of last year, shortly after her arrival, we met a family from Michigan who happened to be in Cancun on vacation – and it just so happened that this family wanted to get to know Back2Back, and see what we were up to in this corner of the world. We picked them up from their hotel and spent a few hours together. 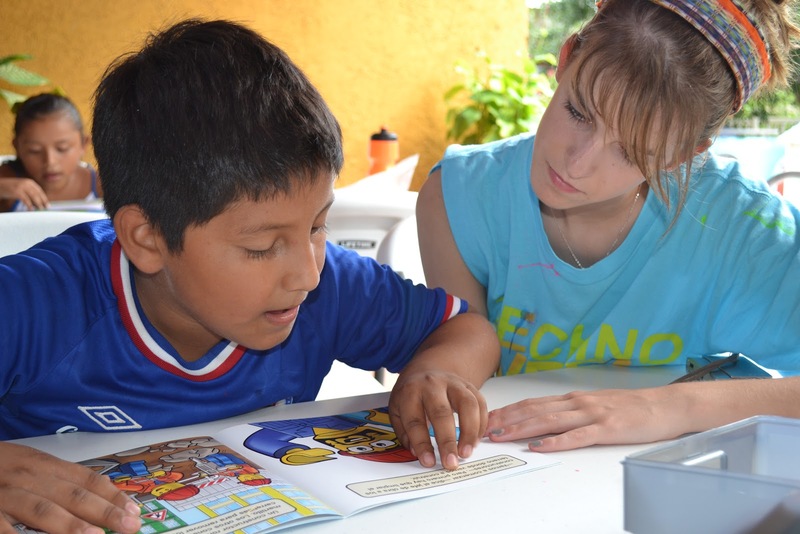 Together we spent some time at Casa Hogar San Jose, and they met Betty. That morning God made a special connection between Betty and the family’s young daughter. Their family decided to sponsor Betty through Back2Back’s Shelter Child Sponsorship Program and then in return we help facilitate on-going communication through letters between Betty and the family. During our trip to the midwest in August, we were able to get together with this family in Michigan who have not only become advocates for the ministry, but friends of our family as well. 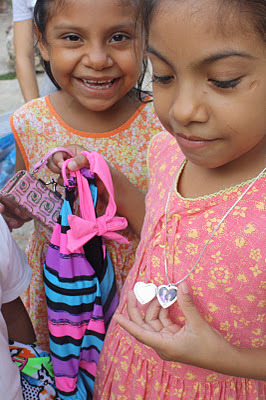 At the end of our visit their young daughter gave us a little tiny purse with a note attached and asked if we could take it to Betty when we got back to Cancun. Below is Betty displaying what was inside the purse: a locket with a picture of her and her long-distance friend from Michigan. What a special gift for a very special girl. We love seeing Betty smile. We love the way God connects His people, the ways He cares for the orphan, and for the ways He lavishes His love upon children like Betty. We had the thrill, honor, and privilege to come alongside an incredible ministry, Back2Back, and partner with them to use a free dance camp in the children’s homes to communicate that Jesus is pursuing the heart of every girl, calls them His princess, heroine, daughter, and His beauty. We are back from our trip and awestruck, even still, at how such an incredibly awesome God would allow us three to be a part of sharing His crazy, wildfire love to the orphan girl using dance as the vehicle. We pray with every fiber in our being that the message we shared has begun to take root in their hearts and that these girls really begin to believe into the truths that there really is a Kingdom, there really is a King, and we really are His princesses. And most of all, that this is no fairytale. 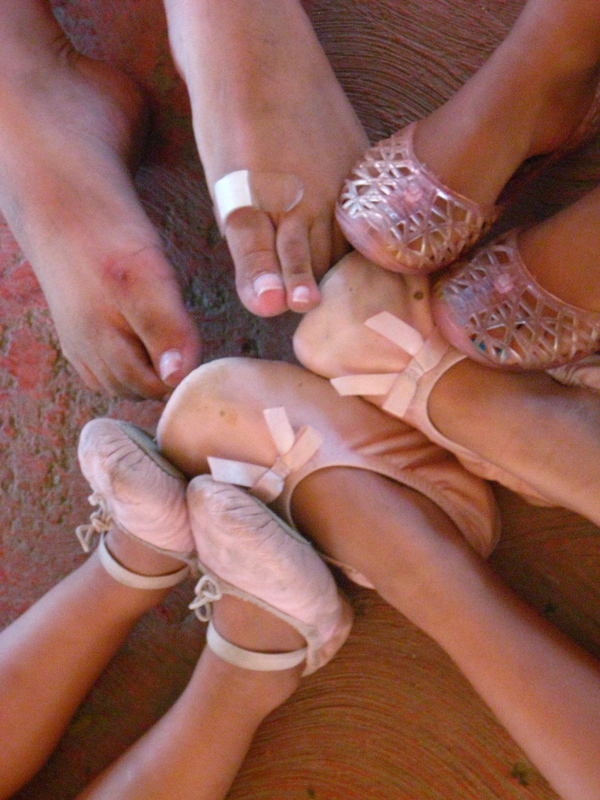 Every day in class, the girls prepared for the recital to be held on Thursday night. The evening of the show came, they were both excited and nervous as they walked to the pavilion where they would perform. The space was packed with an audience of children’s home staff, Back2Back staff, and short-term mission workers. As each dancer was introduced, the audience erupted with cheers and held up signs with their names. Then the sweet girls began to dance – from the boisterous two-year-olds, to the shy fifteen-year-olds – spinning, jumping, all joyfully praising their heavenly Father. After all, isn’t this how God wants all of his daughters to see themselves -completely captivating, and totally adored? One of the sweetest moments we were able to witness was the girls engaging in an activity to love their friends in a tangible way on day four of camp. They drew names from a hat and made princess crowns for one of the other dancers. We circled up when everyone was finished gluing on the last gem or affixing the last, perfect sticker to their friend’s crown. Then, in that moment, they begin sharing life giving messages and words of encouragement to each other that they thought on while assembling the crown. The girls said things like “You are beautiful”, “You are smart”, “The King is captivated by your beauty” as they placed the crown they made in the hand of their friend. It was such a sweet moment as they learned and were witness to the power of speaking truth into someone else’s life. Celebrating right after the recital with a big group shot - beautiful girls relishing in the joy of dancing before their King. These are the kids with whom Jesus is now staying. All names have been changed in the story. So many emotions went through my head yesterday. You see, I thought I was just going to help out a friend from the Rio and a couple hours later I’d return home. Good deed done and nothing different. Boy was I wrong. Diana is a girl who must be 26 or 27 years old. She lives with her six year-old daughter and her boyfriend. Truth be told in my three years working at the Rio 1 community (a poor neighborhood of wood, tin and scrape houses that people have built along a riverbed), I maybe have seen him a time or two. And the one time I saw him, he was drunk. Diana is my friend. She is quiet and hardly speaks unless spoken to. In fact, I learned more about her and heard her speak more words yesterday than in the three years combined since I met her. Meme, a Christian leader in Rio 1, had told me that Diana had a brother who wanted to go to a children’s home and asked if I could help them get to Manantial de Amor. This children’s home is about twenty minutes from their house and is one of the closest to them. I said sure, not really thinking through what I’d experience that day. When I went to pick them up, I saw a smiley twelve year-old boy who spoke few words. It must run in the family, I thought. Diana was glad to see me and asked Sarah, her daughter, to hurry along as she went with us. As we drove there, I tried to start the conversation with simple questions asking them if they had the paperwork they needed, asking Jesus if he was nervous. Twenty-six year old Diana is not even five feet tall so I knew she had asked the question innocently. We explained that Diana was there with her daughter, Sarah, to see if her brother, Jesus, could enter the children’s home. It was then that the hard questions came. “Do you have custody of your brother?,” said the children’s home worker. “He abandoned us before Mom died,” she explains. The questioning reveals that Diana is not married, and her boyfriend hardly gives her enough to raise her daughter. As we sit there, I realize that he has brought nothing with him except his papers (birth certificate and school papers). The worker says something that puts a lump in my throat. “So let me see, his birthday is….tomorrow,” he states, but it almost comes out as a question. What a 13th birthday memory he will have, I think to myself. As they finish the interview, he is brought two pairs of pants, two sets of underwear and three shirts. He is shown his bunk bed that will be his new home. The worker does a great job of explaining the responsibilities that the home has to him, including visiting rights that she will have. He explains that they want to maintain a strong relationship with him and his family. The lump comes back in my throat. He also explains that the responsibilities Diana has include signing up Jose for free public health insurance and not taking him off the property for fifteen days, etc. When it came time to say goodbye, Jesus seemed strong. Not seeming sad at all. I remembered another child that we work with once tell me that he never gets homesick. The sad feeling that I felt when I heard that swept back over me as I wondered if he no longer gets homesick. Then I looked at Diana, I’ve never seen a lot of emotion on her face before either. But I could see it now. She didn’t want to show her hurt to her brother. You could see the effort she was putting into being strong for me. As for me, I was crying for them both. I knew Jesus needed this home. I knew Diana was grateful for the opportunity her brother would have to go to school and eat well. Still I also knew that if they could they would trade it all to be together. Today was Jesus’ birthday. I found myself thinking and praying for him all day long. I pray this promise over Jesus and all the kids that we serve. I have a new appreciation for the workers who don’t just provide clothes and food, but so often are there to wipe away tears, listen, pray with and over children, to teach them that Jesus Christ is the only one that can change lives. Sometimes we experience difficult times with others. I used to try and avoid it, now I see the blessing in being a part of the intimate moments of people lives. Yesterday I thought I was going to run errands for a few hours. But what God had for me changed my life. Lord, help me see what you have for me tomorrow. Interested in an Internship with Back2Back? Back2Back summer interns gain practical hands-on ministry experience by serving at our sites in Mexico, India and Nigeria. Interns work alongside Back2Back staff members and assist behind-the-scenes to host summer mission trip groups. Interns help to facilitate daily work projects at local orphanages and outreaches to impoverished communities, contributing to our mission of providing care for today and hope for tomorrow to orphans. 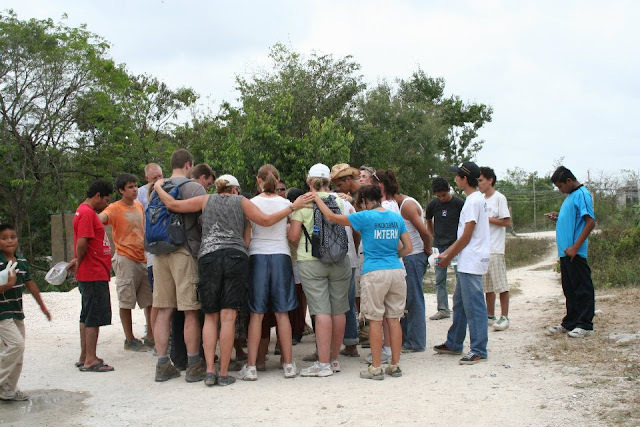 The program includes discipleship and leadership training directed by Back2Back staff members. Back2Back offers options in terms of length; selected candidates can request to intern for one-month or two-months. All internship positions are unpaid. 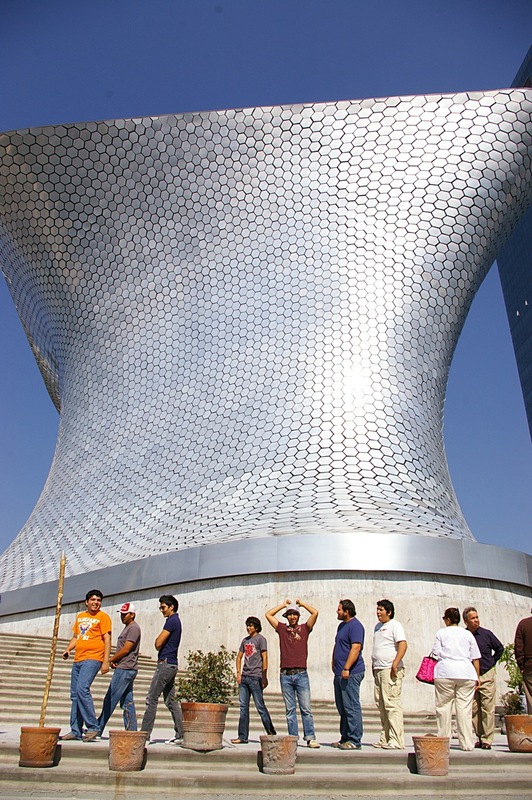 The deadline for Mexico summer 2012 internship applications is October 21, 2011. The deadline for Nigeria and India internship applications is October 7, 2011. Interested? 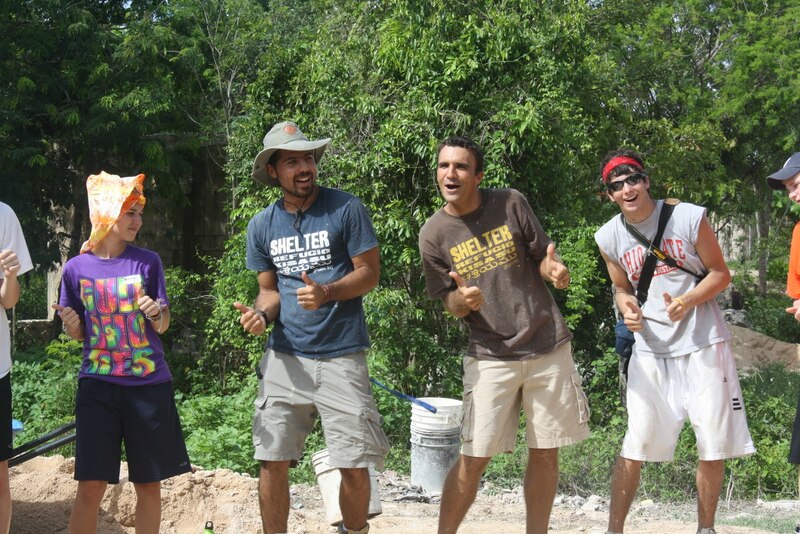 Email Chelsie Puterbaugh at chelsie@back2backministries.org to request an application for a Mexico internship. 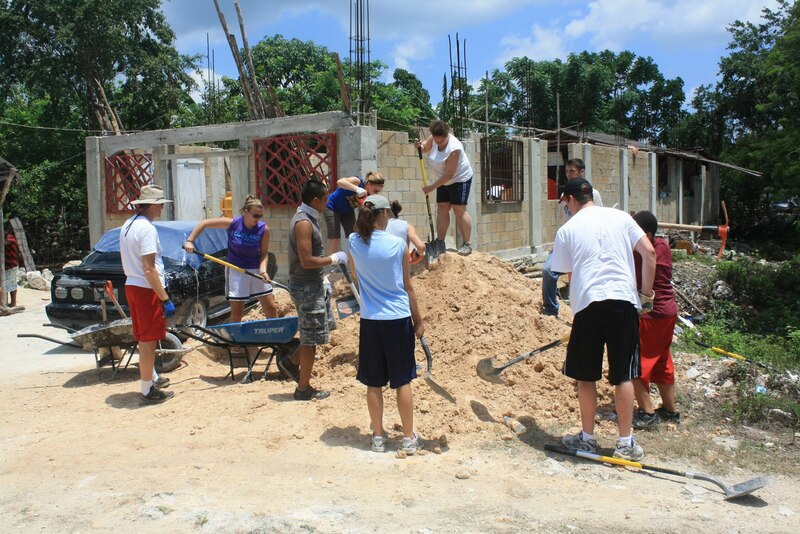 Contact Chris Ramos at ramos@back2backministries.org to request an application for an India or Nigeria internship. Back2Back India summer intern ministers to local girls. Back2Back Nigeria intern spends time with a local girl in Nigeria. A Nigeria intern spends time with a girl in the village near Back2Back Nigeria. 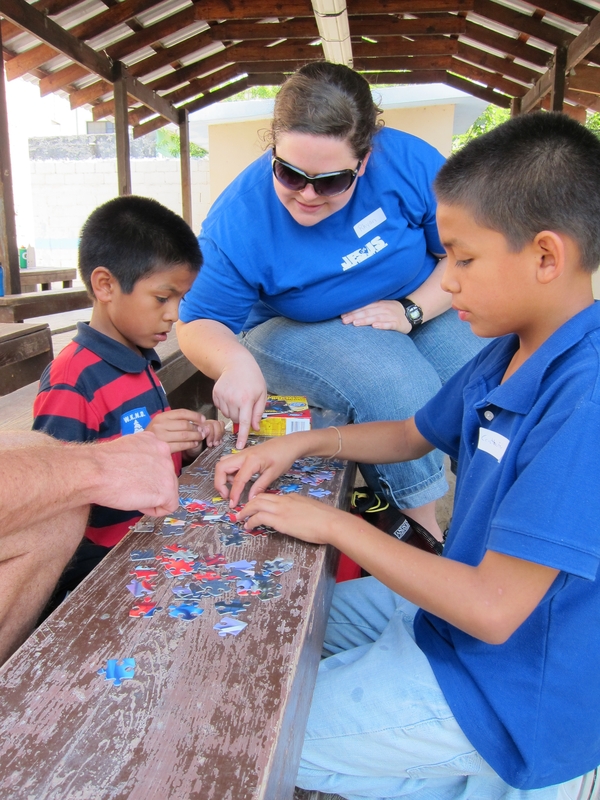 Interns participate in crucial work projects at the children's homes we serve. Interns make meaningful relationships with the children we serve. 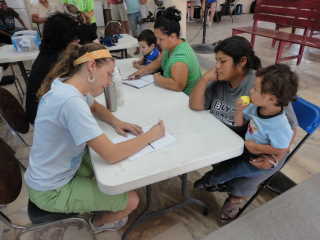 Interns enjoy one-on-one time with the children we serve. This fall, we welcome six new students into the Hope Education Program. Through the Hope Education Program, we offer students from children’s homes a way to continue their education when free public school ends at ninth grade. The students stay on the Back­2Back campus in homes with staff families (house parents), experiencing a healthy family life. Students are mentored, provided with an education, and encouraged to pursue their dreams so that they can become self-sustaining individuals. Already, they are being faced with the challenge of learning how to navigate the public transportation system to and from their new schools. They are attending schools with some of Monterrey’s wealthiest families and are being challenged to compete academically and blend in socially with this new crowd. Additionally, they are learning to manage new jobs on and off campus to help pay for their transportation. We are excited to say that the seasoned veteran students in the Hope Program have extended a warm welcome to the new kids on campus and are showing them the ropes. We are full of anticipation, eager to see how the Lord will use us and the teens who we have already invested in to shape and mold the new students. We are hopeful that with the start of an education, the love of a family environment, and the encouragement of other believers, that these seeds have landed on fertile soil ready to grow. With each visiting missions team over the summer we had the privledge of partnered with Pastor Victor in his ministry out in Tres Reyes. 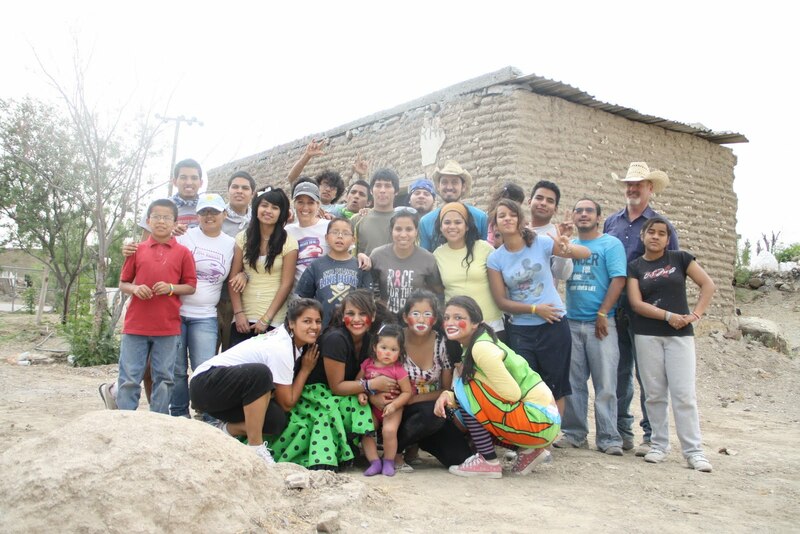 The name of Vicotor’s church is “La Hermosa”, which means Beautiful – and for us it has been the beginning of a beautiful friendship with the pastor, with his church, and with the neighborhood. 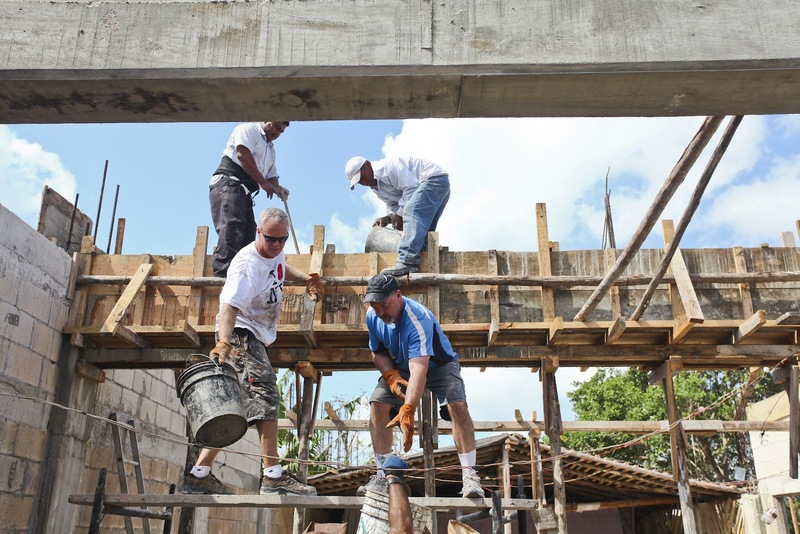 Over the course of the summer we were able to tear out the hold floor, to back-fill the necessary areas, to pour a new concrete floor, to assist with resources for a temporary roof, and to help begin a new bathroom at the church. Each week we were there we also had a chance to visit with neighbors and invite kids back for the church’s children’s program. 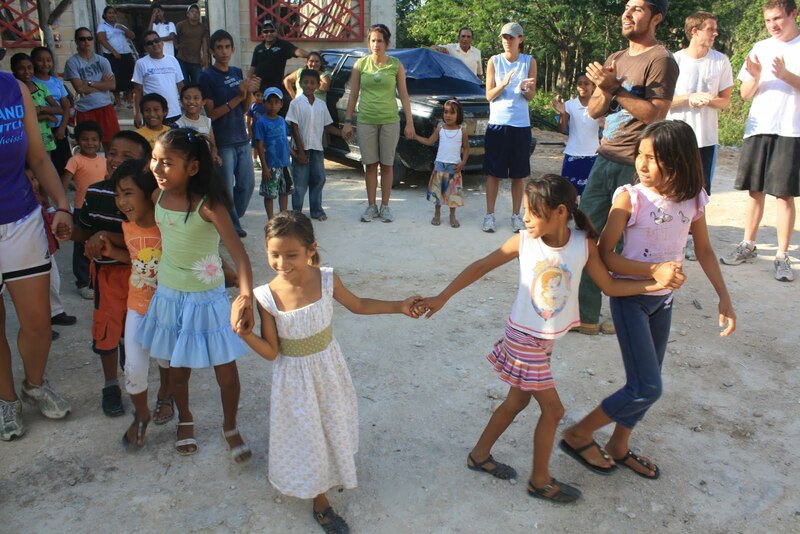 When we invited kids back we had a chance to do songs, games, some skits, and provide them with an afternoon meal. What I think I loved most about the summer was getting to see more of pastor Victor’s heart and passion for the Lord, and for the lost of Tres Reyes. I loved seeing that God encouraged him through the support, and through the relationship. And I love that God is smiling upon this little place called Beautiful! Many of the children’s homes that we serve lack the funds to purchase fruits and vegetables. A normal lunch or dinner in a children’s home consists of rice, a tortilla, and eggs, beans, or ground beef. These foods are inexpensive and easy to make in the large quantities three times a day. As a result, the children’s diets lack essential vitamins and nutrients that are found in produce. However, the Shelter Child Sponsorship Program is enabling the children’s homes to begin to provide more balanced meals, supporting the growth, health, and development of the children. The children’s homes are now purchasing fruits and vegetables on a regular basis. 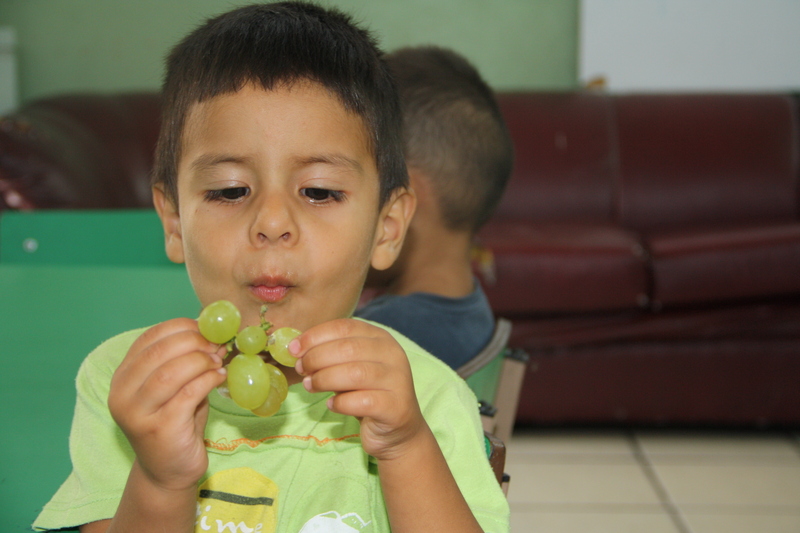 At Casa Hogar Del Norte, the children had grapes, watermelon, and a salad to go with their lunch. The children were especially excited to have fruit with their meal. They view it as being a special treat, since until recently, they rarely had it. The caretakers didn’t have to ask the children to eat their fruit. In fact, after finishing their portion, they were all asking for more! 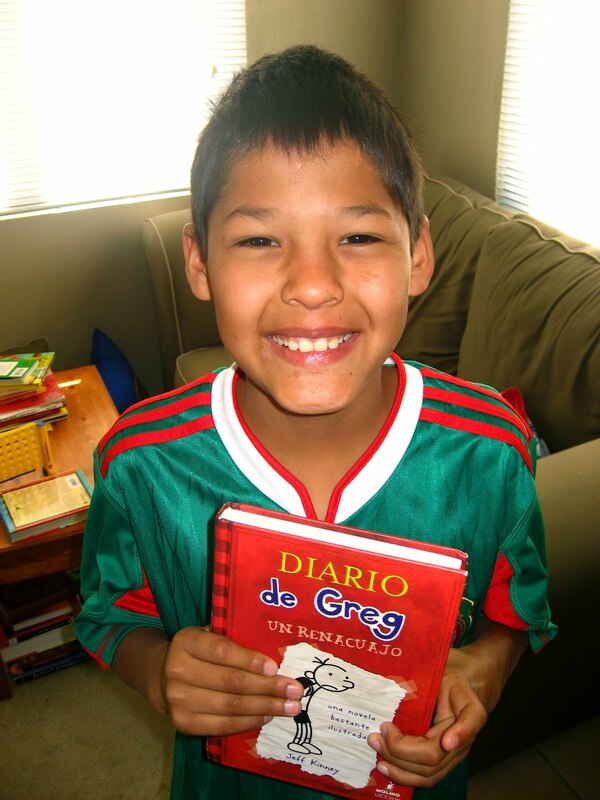 When ten-year old Adrian was asked what he wanted to be when he grew up, he responded with “the president of Mexico.” Martha, the director of Del Norte Children’s Home who posed the question, was impressed but knew what this would require of Adrian: the ability to read. Martha made it clear to Adrian, that if he was really interested in being the president, he would have to read a lot. 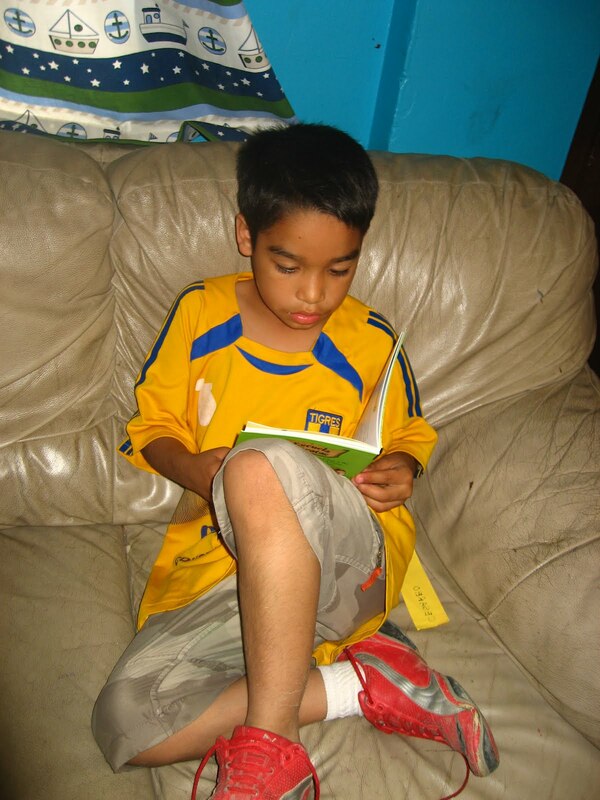 From that moment on, you could count on finding Adrian tucked away in a nook somewhere in the Del Norte library reading one of the many books the library has to offer him. In fact, even a year after this conversation,Adriancan still be found in the library preparing for his presidency. With each visitor that arrives at Del Norte, we are certain to give them a tour of the library, emphasizing the importance of reading, encouraging each guest to spend an hour or so of their visit reading with a child. Through this initiative we have seen the children’s reading skills improve, even finding their interest in reading growing as they now enjoy reading on their own. 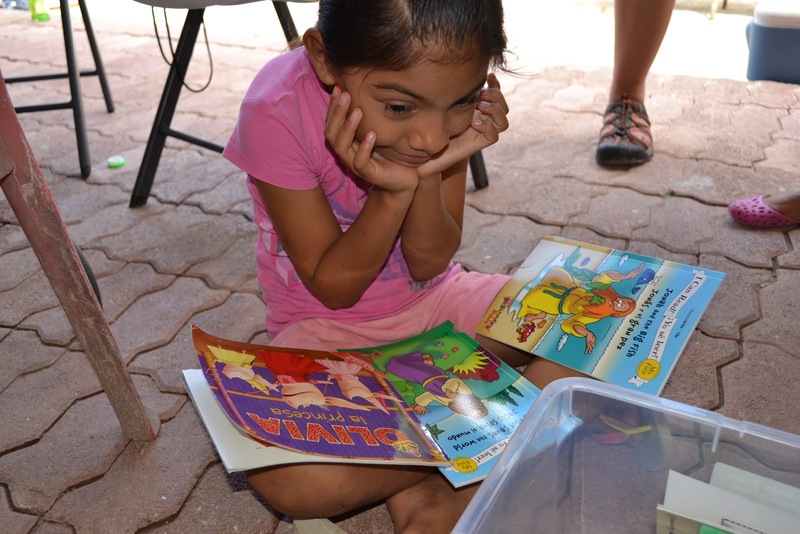 Other local groups, individuals from churches and universities in the city who visit Del Norte are joining in these efforts, coming alongside the children as they develop their reading skills. As we strive to improve the reading skills of the children, we are hopeful this will plant a seed, assisting in developing them to become successful youth and eventually successful adults. 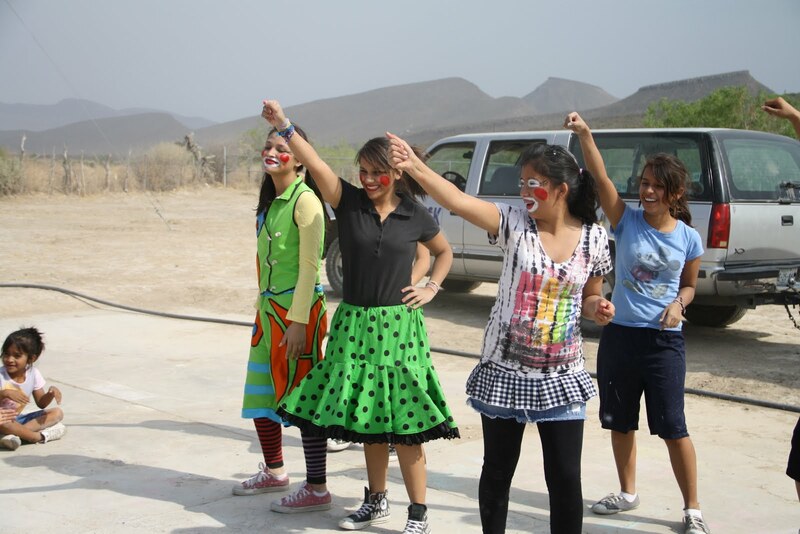 This summer, the Back2Back Child Development Team rolled out a new program for groups from the US to participate in at our Monterrey, Mexico site. We spent the year studying child development in institutions like children’s homes, looking at what the Bible says our response to the poor and orphan should be, and how we can make a deeper and lasting impact in the lives of the kids we serve. We did a lot of staff training and read a lot of books. Now, we are finally ready for some action steps! The first thing we’re doing is to request that groups no longer bring candy and dollar store presents (like silly bands or little trinkets) to hand out to the kids. Most people do this because they want to connect with a kid and make a difference in their lives but don’t always know how or don’t know Spanish. So, instead of candy and gifts we’re doing Play With Purpose! These are planned out activities and games that bring the group members and children together and develop a variety of skills. Some are just physical because our kids need regular exercise. Some are to work on social skills, some are educational, and some are Bible lessons. After four weeks we’ve seen great success! Yesterday, a group took nail polish and all the goodies to do a big spa day for the girls in a children’s home. They got the royal treatment soaking their feet in warm soapy water, foot and hand massages, and pretty nail polish. Those girls felt like princesses, which is exactly who God says they are: beautiful and valuable princesses of His kingdom. 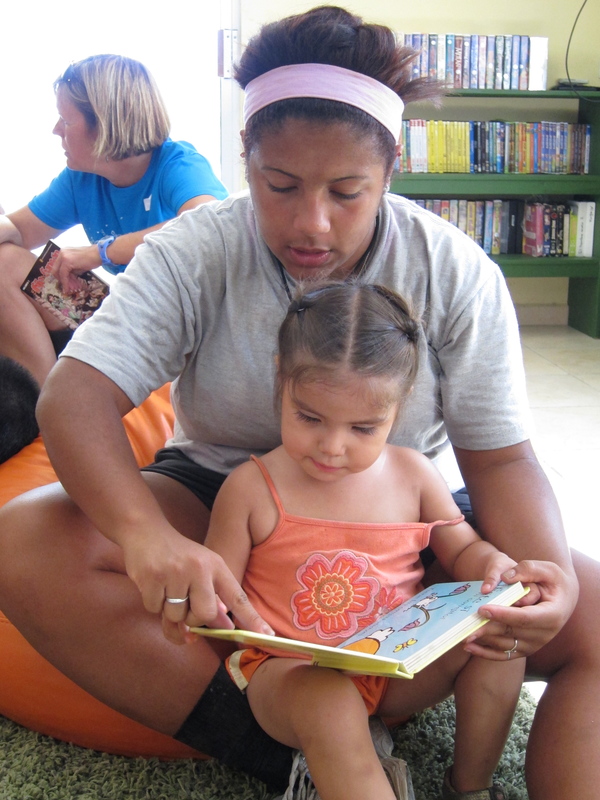 Group members read with children at a children's home library, thanks to the generosity of ministry supporters. Working on puzzles teaches spacial awareness and problem solving skills. 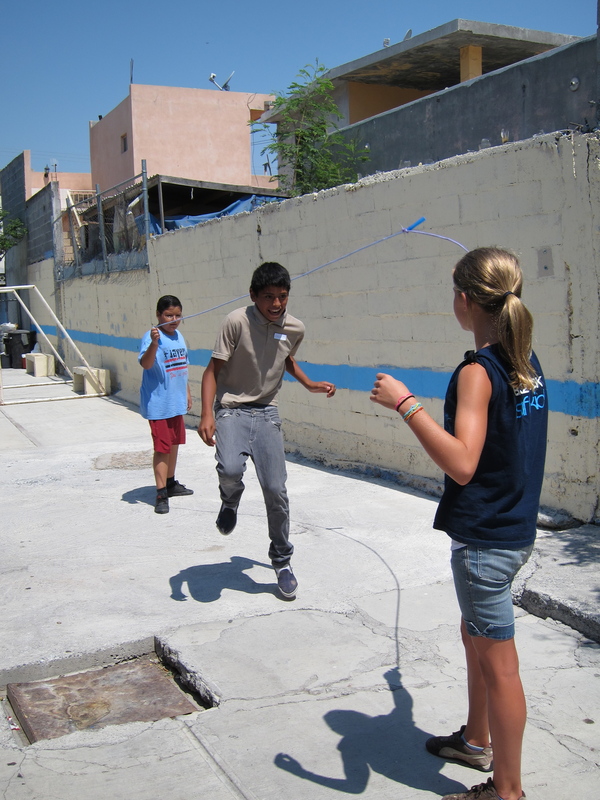 Alonna plays jump rope with children at Manantial de Amor. Physical exercise is a huge piece of child development that kids in children's homes are often missing. 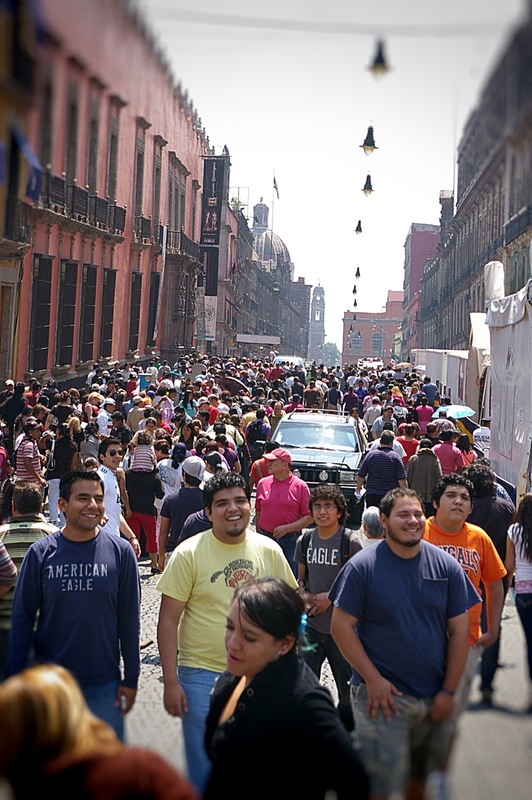 Our Hope Program students recently traveled on a five-day field trip to Mexico City. 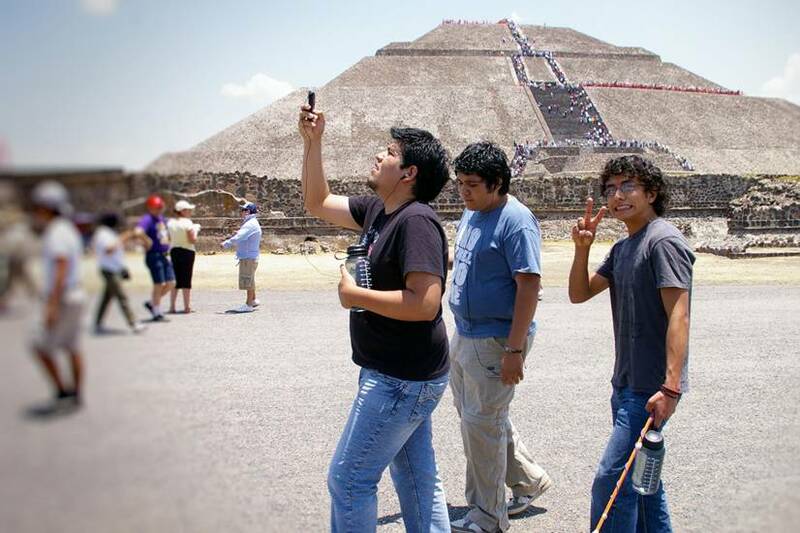 This trip was intended to serve as an opportunity to expose the students to the historical and cultural background of Mexico. We visited the anthropology museum, the historical center, the National Palace, the ruins of the Templo Mayor, the Metropolitan Cathedral, the Palace of Fine Arts, the Paseo de la Reforma, the Pyramids of Teotihuacan and the New Museum Soumaya, which has recently opened and is already considered one of the best art museums in the world, with over 16,000 works of art. 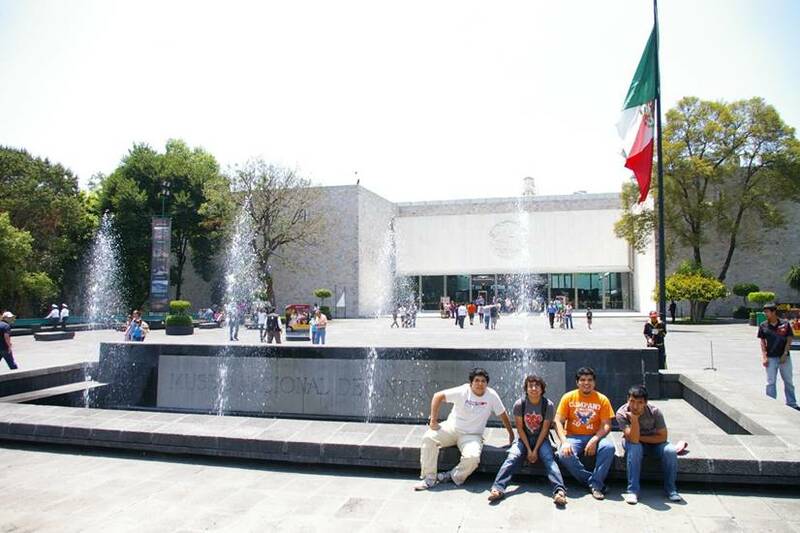 The museum has works comparable to Dali, Degass, Van Gogh, Picasso, Tamayo, Diego Rivera and many others. On our way back from Mexico City, we stopped in Galeana. This town is home to three of the boys from the Joseph House, a Hope Program home on the Back2Back campus. It was exciting to let them show off their town and some of their relatives in that town. 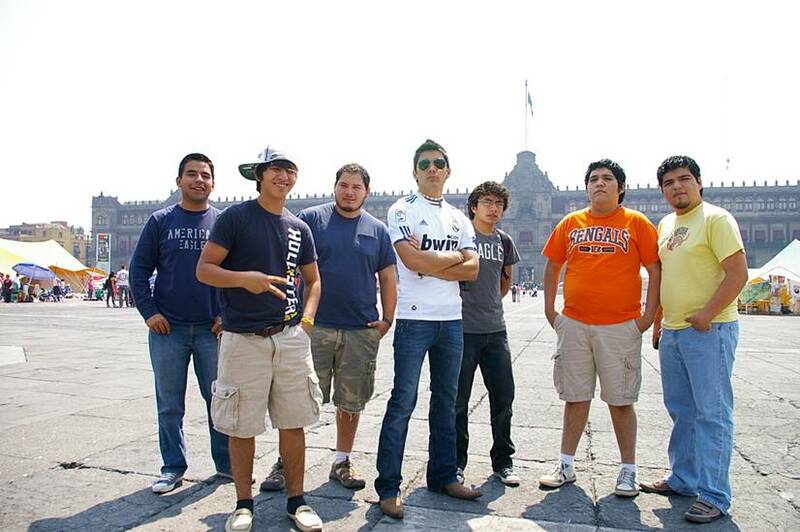 We were able to thank God for the opportunity to travel together and discover more about Mexico. I also enjoyed watching them try different foods and adapt to new experiences. They had great attitudes even when they were hot or tired and gained a tremendous amount of appreciation for their heritage. I was very happy to share the history of our country with the boys and to collectively learn how to create a better society for our future. Through the Hope Education Program, Back2Back offers students from children’s homes a way to continue their education when free public school ends at ninth grade. The students stay on the Back­2Back campus in homes with staff families (house parents), experiencing a healthy family life. Students are mentored, provided with an education, and encouraged to pursue their dreams so that they can become self-sustaining individuals. To learn more about contributing to Back2Back’s Hope Program, please contact our US office at 513-754-0300, ext 1707. A few weekends ago, a few staff members took the Hope Education Program students who live on our campus on a mission trip to an orphanage about 1 ½ hours away in the desert. We loaded up two Back2Back vehicles with food, luggage, work supplies, and teens to try a new adventure. None of the teens were sure what to expect but we wanted them to experience what our work teams experience when they come to Back2Back. The teens took turns helping prepare meals and clean up and they all were very willing to help! The morning started with breakfast, quiet time, a small group time, and then prep to leave. 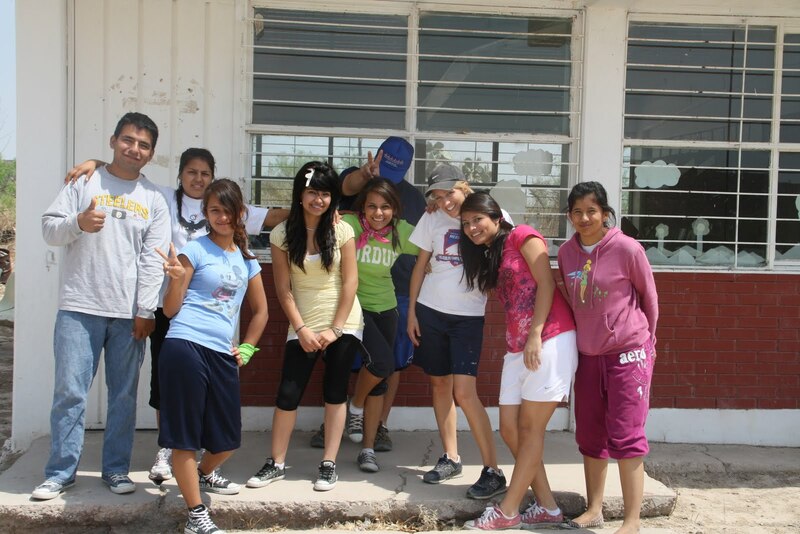 We headed out Saturday to the nearby pueblo (small town) to do a work/outreach project. 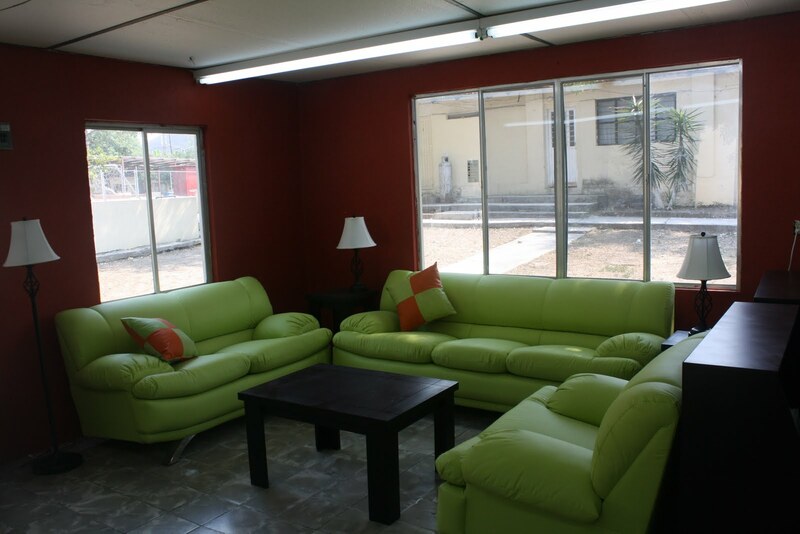 The clinic needed repair and we painted, did electrical work, and repaired doors, etc. There were lots of children hanging around watching. We handed out lunches to these same children and ate together. 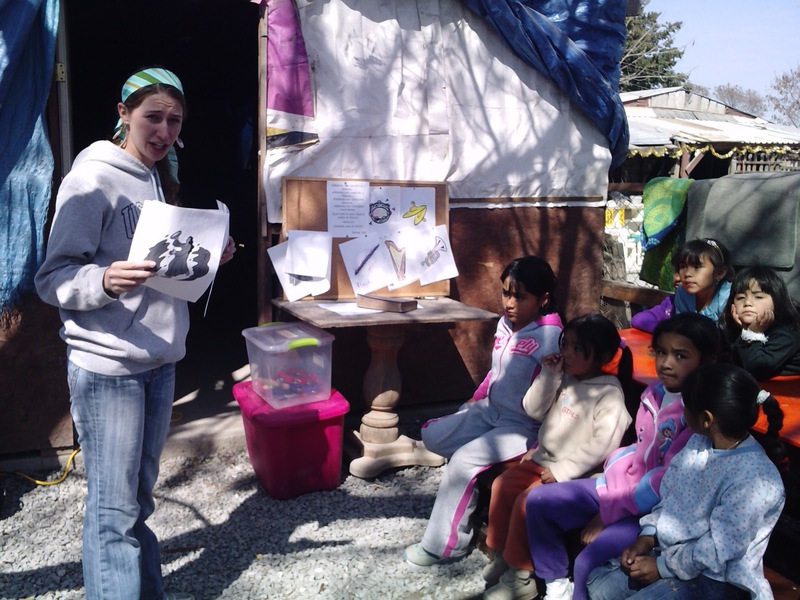 After a day of work, our teen girls had prepared a kind of Bible School for the local children. They had a Bible story of David and Goliath and an art project, and games. 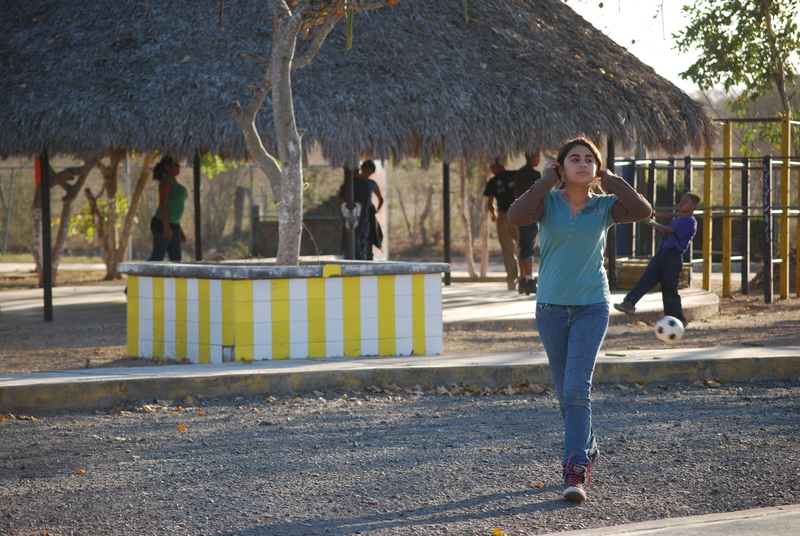 I loved watched our teens faces as they played and helped the children. There were so many smiles everywhere! 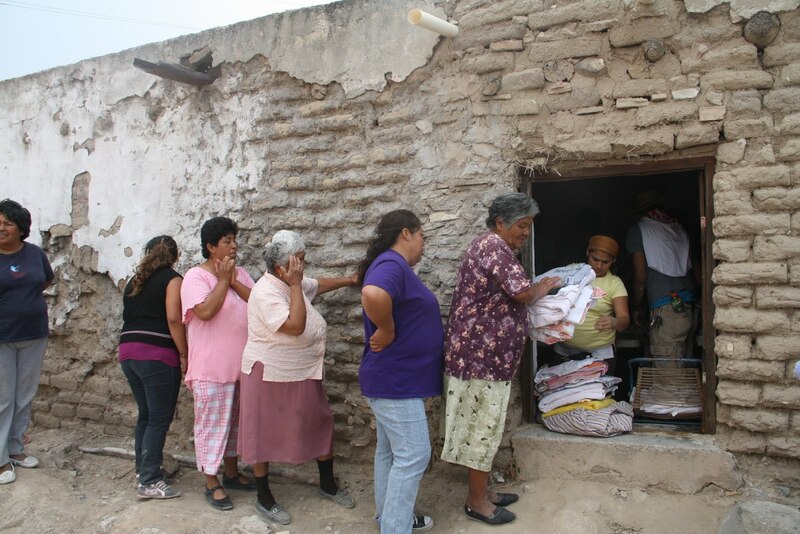 Meanwhile, we also gave out sheets, towels and food to the women of the village. The day ended with us circling around and praying for the people who had come out. I watched as our teens lay hands on the children and prayed over everyone and my heart was full of joy! That evening in debriefing almost everyone of our group said they hadn’t been sure about this trip and didn’t really want to come, but their minds had been changed and they loved it! Sunday we visited a local church and went back to hang out a little more with our new friends at the children’s home. I know I saw some tears as we pulled away to head back to Monterrey. What an amazing opportunity for these teens who have mission groups coming to them and serving them, to go out and do the very same thing! God is moving in them and they are learning to serve Him. They are ready to go again! Through a series of God-events, we have met a pastor by the name of Victor. Pastor Victor has a small church in a neighborhood named Tres Reyes. 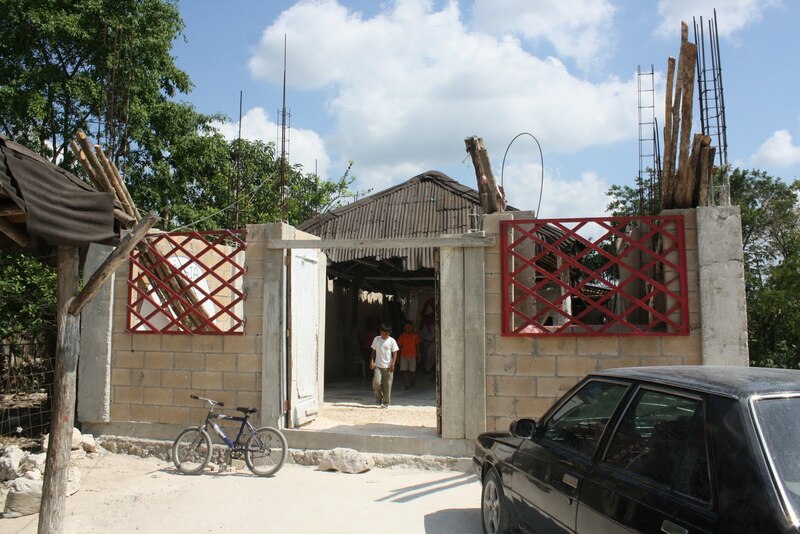 Tres Reyes is the same neighborhood where we have been helping Noehmi’s family build a house. 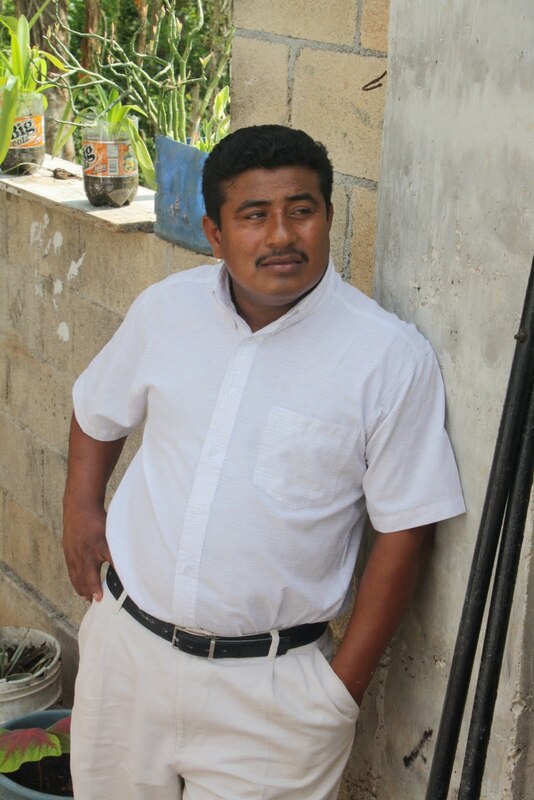 Victor has a desire to reach the people Tres Reyes for Christ. He has a desire to see the Kingdome of God grow. 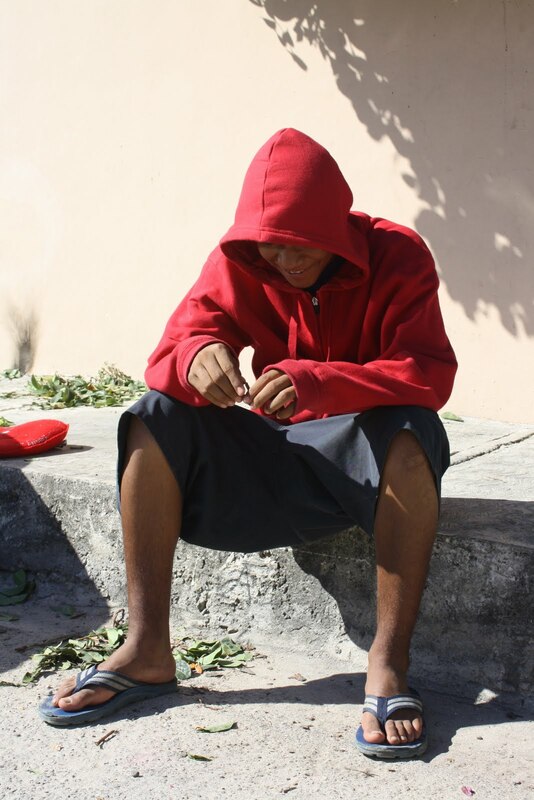 He has a desire to begin to feed children in the neighborhood but he needs someone to stand in the gap with him. We believe that God has led us to Pastor Victor for this season. God has opened a door – and once again we’re walking through it. 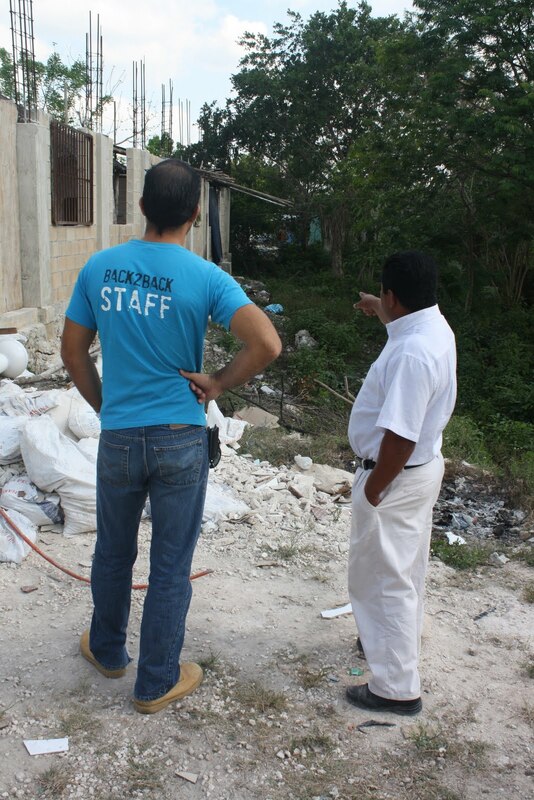 With the visiting missions teams we will have over the next couple of months we are going to be helping Pastor Victor with some projects on his church, and assisting him in outreach to the children and families that live in this extremely poor neighborhood. We look forward to working together as we feed the hungry, love the needy, and bring hope to the hopeless! Bathtime with more than one child can often get a little crazy. Imagine trying to shower and dress ten boys ages 3 to 8 at one time by yourself. I like to think of it as organized chaos. 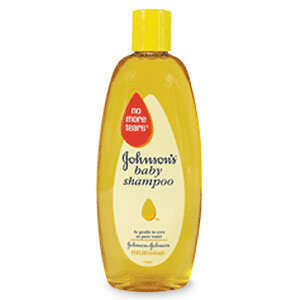 It didn’t take me too many weeks of this to figure out that if I don’t have tear-free kids shampoo, about half of the boys would refuse shampoo with violent tears oddly enough. So now I’ve made it a mission to make sure that every week these boys have kids shampoo and kids toothpaste. After bath time, one of my boys saw me putting one a day’s worth of shampoo for ten boys from the full size bottle into a small bottle that we leave within their reach. If you leave the big bottle down there, inevitably one boy will knock it over on accident or pour the whole thing out for his pleasure. I told him very directly that to me it’s very important that they have tear-free shampoo everyday and that they bathe everyday just like it’s important to me that they have “non-spicy” toothpaste. But if the whole bottle is down there, someone might waste it and then they won’t have kids shampoo anymore. I stopped my mopping of the soaking wet bathroom and looked at him and said, “Do you know that God is trying to demonstrate his love for you by sending people to take care of you? That’s why I’m here. God sent me here to love you. That’s why your full-time care-giver is here. That’s why Sammy loves you (his favorite Back2Back intern). I told him again for the 100th time that day that I love him very much. We then went on to dialogue as I mopped that God will never leave him alone and that there will always be someone to take care of him. This particular child has severe fear issues. He’s always afraid that one of his brothers will leave him or that his mom will never come back. But this child is learning that God isn’t going to go anywhere. It was a beautiful end to a chaotic daily event. The privilege of going to school seems like a given, especially to attend kindergarten. But what if you can’t afford to send your child to kindergarten? 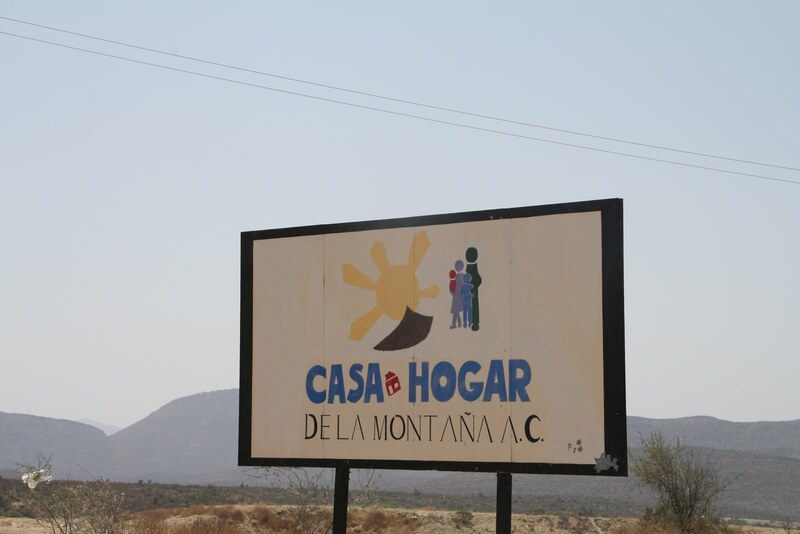 For the kindergarten age children who live at Casa Hogar San Jose, they have to pay $10 USD a week to attend school. It doesn’t sound like much, but when you multiply it by four children, and all of the weeks they attend school, it starts to add up! 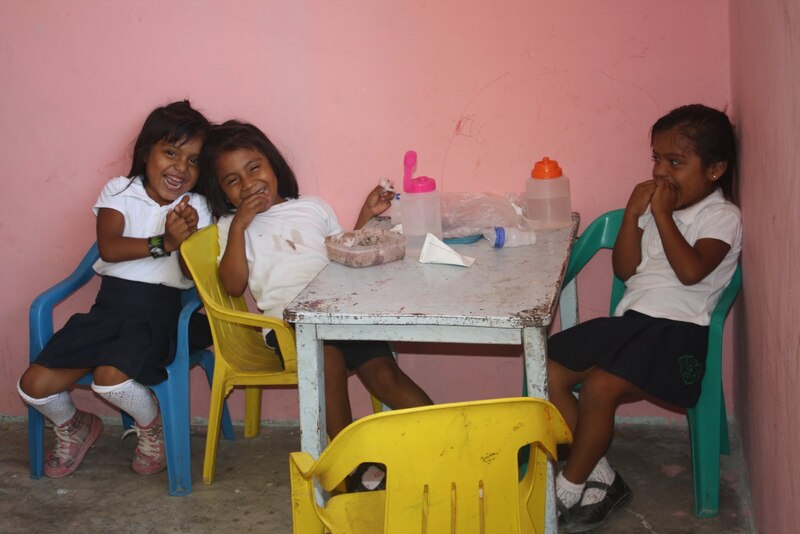 Mari, Chave, Sofia and Alexa are four little girls from Casa Hogar San Jose who are all in kindergarten. Thanks to some individuals who gave money at Christmastime through the Back2Back Christmas Catalog, and through families who are sponsoring children through Back2Back’s Shelter Program we were able to cover the majority of this bill for these four girls this year. Last week, I accompanied the director of the home to the school to make a payment because they had gotten behind a few weeks. When I suggested we just go ahead and pay what they would owe for the rest of this school year the director was speechless. She was both overjoyed, and overwhelmed. Thank you to those of you who have given! Thank you for making it possible to bless this children’s home in this way, and thank you for blessing four little girls, whose education is one of the most important things we can give them. 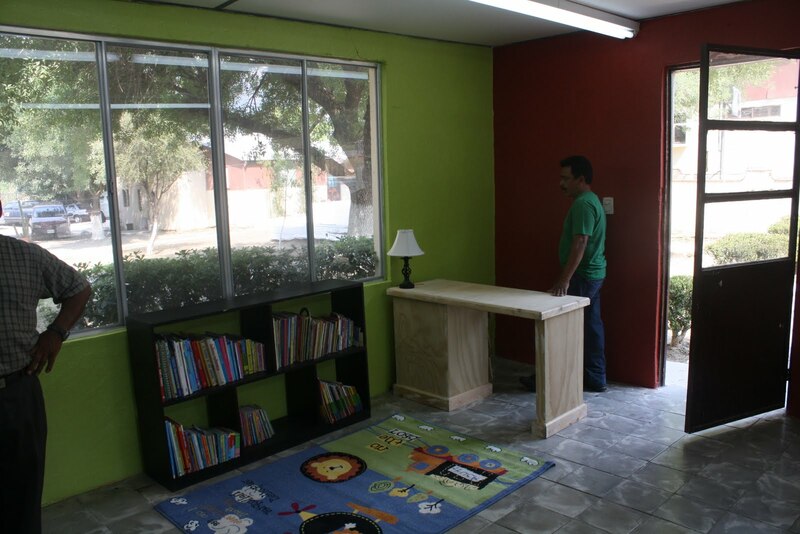 We recently completed remodeling the library at Casa Hogar Douglas. 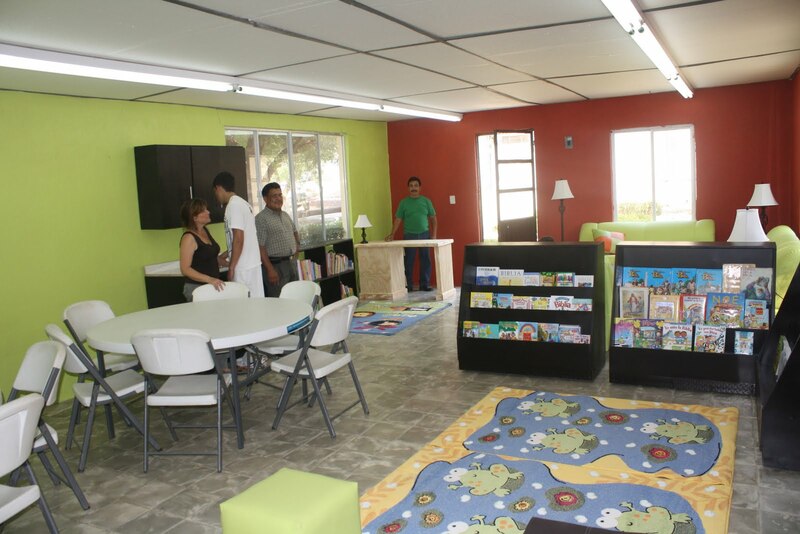 This children’s home for over seventy kids now has a very nice library made possible by a donation from The Rotary Club International and the tireless efforts of many of our ministry volunteers. 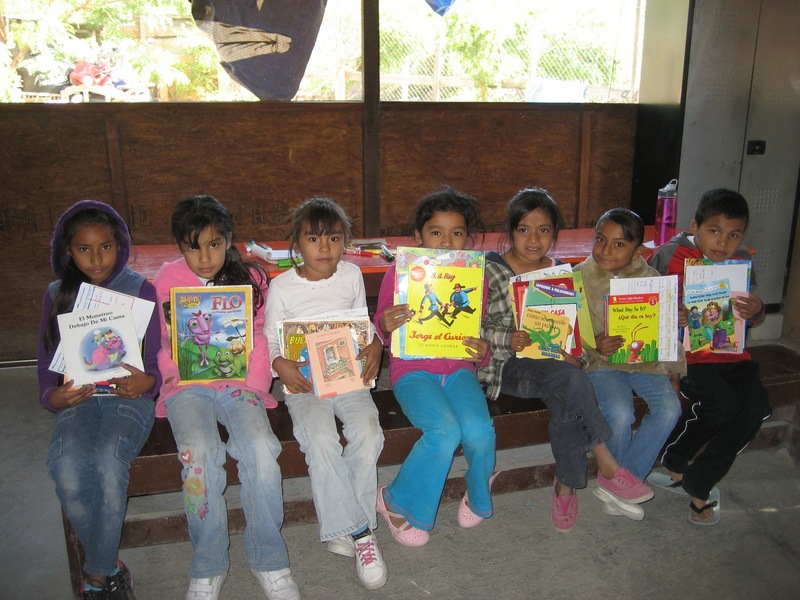 I recently read that 94% of the municipalities of Mexico don’t have a library. The reader index for Mexico is the lowest in Latin America. Back2Back is eager to help each child develop a love for reading and ultimately provide them with opportunities to improve academically. 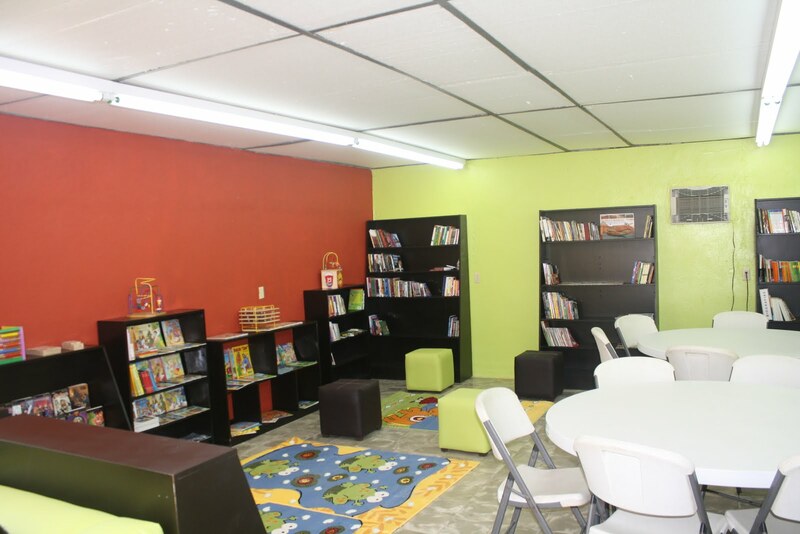 I am so excited that these kids will have an opportunity to benefit from the blessing this library will be! This spring, we have been teaching the children in the Rio about worship. It has been fantastic! A donor supplied us with money to purchase instruments for the children and thus the idea sprang into action. Our heart was to teach the kids not only how to worship the Lord but reasons we have to worship Him! When we truly know His character there is nothing left to do but worship. My favorite day of our worship unit with the children was when we taught them about Miriam praising the Lord after he saved the Israelites from the Egyptians. Miriam took up her tambourine and praised the Lord with a new song! After learning about Miriam, we decided as a class that we would write a new song to the Lord just a Miriam did. Back2Back staff member, Cheque, got out his guitar. I pulled out a dry erase board and we began to write a song of praise to the Lord, worshiping Him for the ways that he loves us. Cheque and I started out the song, but in no time the kids were shouting their ideas as well. 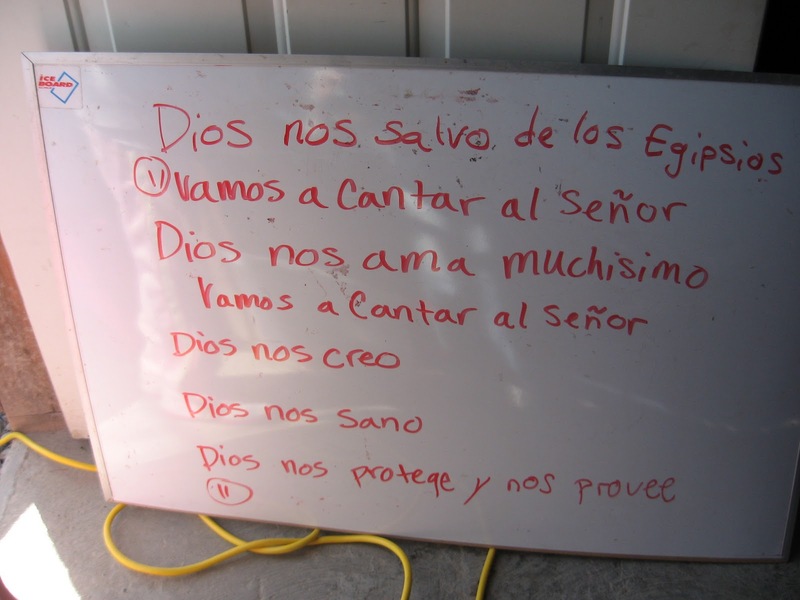 It was the children who came up with most of the words and reasons why we praise the Lord. It was beautiful for me to hear these children, who live with very little, shouting out reasons they have to praise the Lord! Oh how true it is! Within twenty minutes our song was done, Cheque had a tune, and we all began to worship the Lord with a new song! We have now added this song to our collection and sing it each week. Last week, in our ongoing staff training, we talked about the connection between anger and fear. The short of it is that most anger is rooted in fear. Think of anger as a basket of onions. Anger is that outer onion skin that makes the onion messy and dull but protects the insides. 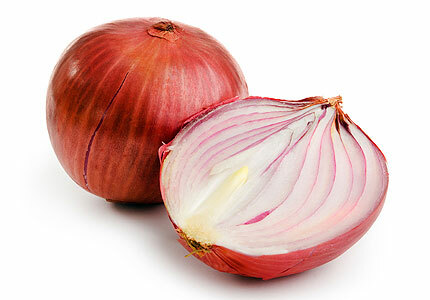 When you peel off that onion skin of anger, what’s left are layers of fears, like the layers of an onion. Often, our anger is rooted in a variety of fears. But if we go deeper and ask God to help us deal with our real root fears, God can take them away and that onion isn’t there anymore. Juan, one of our house parents, shared with me the impact this made on one of our teen girls in the Hope Program. She didn’t want to speak English to a visiting group member, even though her English is actually very good. She said she felt embarrassed to speak English around people. Juan, armed with this new knowledge and sensitive to a nudge from God that there was more, asked her what she was afraid of. She shared that she was afraid to make a mistake. Juan explained to her the onion analogy and said he felt that was a surface fear. After more discussion, she discovered that deep down inside she is really afraid of being rejected. She was dropped off in a children’s home at age two, and felt that she must have done something horribly wrong for her mom to reject her. All her life she’s worked to make sure she’s not rejected again. She gets good grades in school and does her chores and tries to make everyone around her feel good. 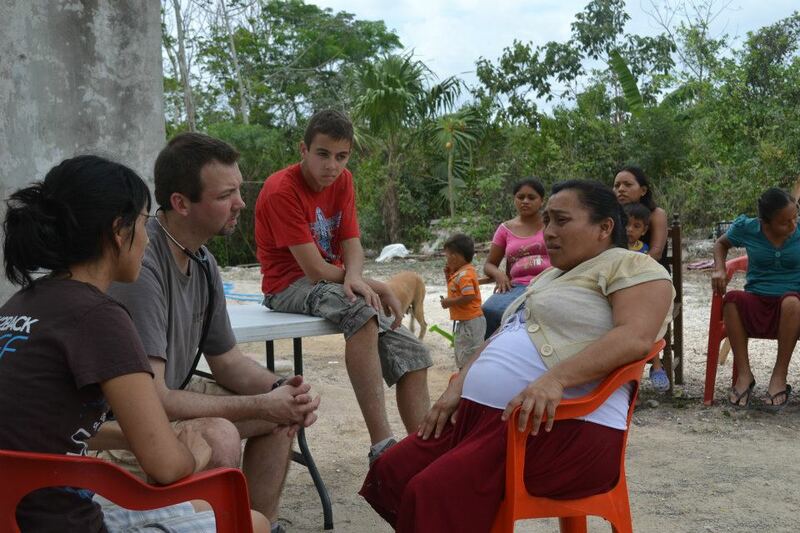 Juan and his wife took the opportunity to share the truth of the Gospel with her, that Jesus never rejects us. They prayed together and through lots of tears she expressed that it was the first time she felt like she understood what was going on inside of her. She could see all of the ways in her life that she was working to not be rejected by people, but what she already has is a Heavenly Father who will never leave her. What incredible hope! When she stopped looking at the onion skin and looked inside, God’s truth could be revealed and the process of removing that struggle has begun. 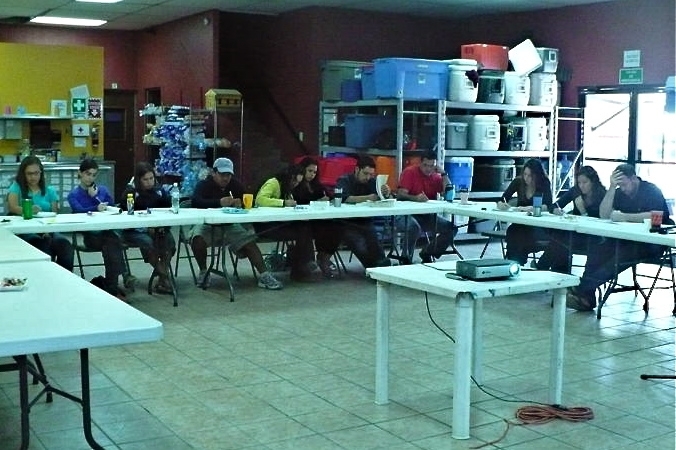 I don’t usually associate spring time with “back to school” time, but that’s what it’s been for our Monterrey staff! We realized a need to be more educated on the psychological and emotional issues that the orphan child faces and had a desire to be more equipped to do something about it. So this spring we went back to school. We kicked this off with a PhD student from Ohio who came to our campus and gave a four-day seminar on issues like domestic violence and the poverty cycle. After that, we launched an eight-week Friday morning training series. We are going through the material that I used to teach to therapeutic or specialized foster parents in the States, and talking about how to implement what we’re learning into our life and ministry here. One of my favorite sessions to teach is the one on attachment issues. We talked about how children who are abused, neglected or abandoned don’t develop trust and attachment with their caregivers, and how this leads to many problems later in life. I was sitting down with one of our Hope Program house parents when she mentioned some issues with one of the boys in her house. We were able to determine that he was struggling with attachment issues, and she now had a variety of ways to approach the situation. She felt empowered and excited to really help her teenager instead of discouraged or overwhelmed. It’s exciting to see how this information is changing the way that many of us do ministry here, and we’re only a few weeks in! 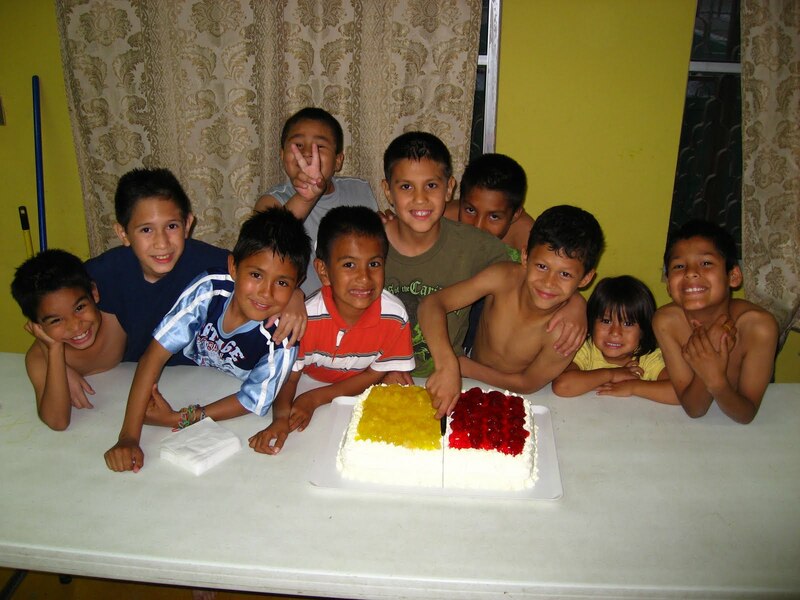 Living with the boys at Douglas this past summer opened my eyes to sad reality that birthdays for these orphans are often one of the worst day of their year instead of the best. They are a reminder that they are thrown into a group, not celebrated as individuals, that their mom or dad didn’t make their birthday a priority and that they are not a priority to mom because she didn’t visit on their birthday or bring them anything. I was shocked once I realized this awful truth. Since then, I’ve tried my best to make sure that each of my boys is celebrated like an individual and treated special on the exact calendar day of their birthday whether it is a special movie we watch with snacks or ice cream just for them on their birthday; we sing happy birthday and make them feel special. Every now and then, one of the boy’s Shelter Child Sponsors gets involved in this celebration. Witnessing this yesterday, warmed my heart because at least for one day, something was right in this situation. Adrian turned nine yesterday. But about six weeks ago, his Shelter Sponsor made sure that he’d be celebrated on his birthday with some gifts and a card so that he wouldn’t be forgotten. His mom didn’t come. His full-time caregivers hadn’t checked the calendar to know that it was even his birthday (I don’t blame them – this has happened to me before). But his Shelter Sponsors were right there celebrating him even though they were thousands of miles away through their words on encouragement in a card reminding him that he is loved and important to them and to the Lord. We sang to him, celebrated him, let him pick the movie that day, and then we ate the biggest cake ever. For one day, he was happy all day and for just one day he felt like a king.